“This was a nice way to start the holiday. Tacos and ice cream. We’re really kicking back,” Beth’s aunt Carole said. We were at the Dairy Queen near the Chesapeake Bay Bridge, after having lunch at Taco Bell. Noah, YaYa, and Carole had flown to D.C. from Pittsburgh the night before and we were all driving to Rehoboth Beach, where we were spending the second week of the kids’ summer break. 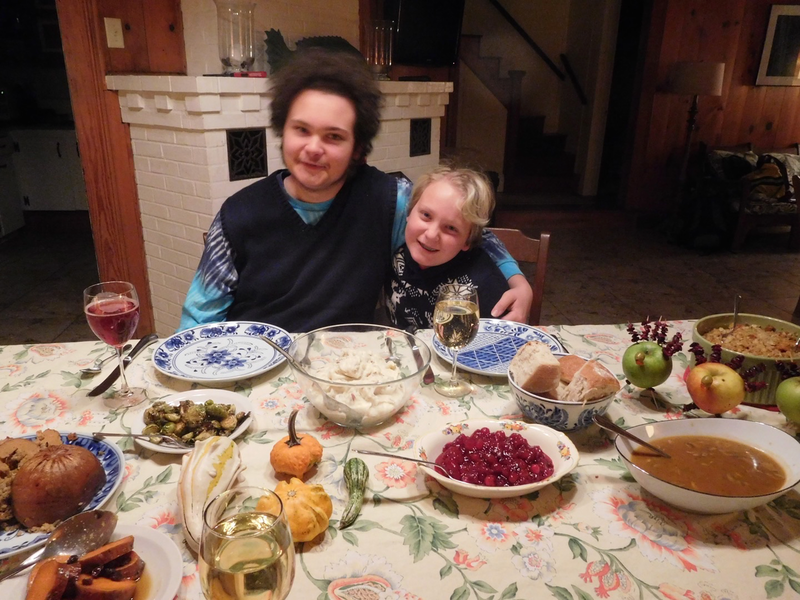 Noah spent the first week in Wheeling with YaYa, swimming in the pool at Carole’s condo, attending a showing of Charlie Chaplin films and watching movies at home. North spent it at home with me. They didn’t have camp, so they lazed in the hammock and played the ukulele, practiced dance moves from My Fair Lady in the yard, and binge-watched Fuller House while I worked. Three evenings they had My Fair Lady rehearsals. They are playing Jamie, one of Eliza’s father’s drinking buddies. I gave them a chore every day but we also had an outing almost every day—to the Long Branch pool, to the farmers’ market to get pupusas for lunch, out to lunch with family friends Becky (North’s old music teacher) and Eleanor (Becky’s daughter and North’s old babysitter), and to visit Lesely, their old preschool teacher, who was at school because she’s running at half-day camp at the school and it had just finished for the day. I felt like I managed a pretty good mix of work and fun for both of us, though exercise and reading for pleasure kind of fell by the wayside for me, except for the day we went to the pool, when I did both. We arrived at the beach house a little after four. After we unpacked, Beth went to get groceries and I took a quick walk down to the beach and got my feet wet. When I got back to the house, my mom had arrived from Philadelphia where she’d spent a couple days visiting with friends on her way from Oregon and our party was complete. We socialized and Beth made dinner—ravioli and salad—then after we ate we listened to North sing an original song, plus one from Dear Evan Hansen, plus “Hallelujah,” while accompanying themselves on the ukulele. Beth and Noah drifted to the porch where they started the 1,000-piece puzzle (a village scene) they would work on for most of the week, (along with YaYa and Carole). North and I didn’t go down to the beach until noon because I was reading with Noah, chatting with various relatives, and helping Beth make a grocery list. This often happens on the first day—the morning is busy and I just can’t wait until mid-afternoon when the sun is less strong. But we were restrained and didn’t stay long, just an hour and fifteen minutes. We were in the water most of the time, with a brief break to sit on our towels to eat cherries and a plum and re-apply sunblock. After a late lunch at the house, Mom and I went back to the beach for a short walk, then we set out on a series of errands, one of which was to rent a bike for me, but I failed in that because Mom dropped me off at the bike shop at 5:02 and they’d closed at 5:00. Gazing sadly through the window at the employee inside did not yield results, so I texted Mom and she picked me up. When I returned to the house Noah and North seemed to be engaging in some preparatory work for music video North wanted to film at the beach. I thought I heard them approach and then back away from an argument on the following topic: Should Noah add instrumental tracks beyond North singing and playing the ukulele? (Noah pro, North con.) I was pleased at their restraint and civility because while they’ve collaborated on several films, the process is sometimes messy and fraught. Mom and I made dinner—veggie burgers and dogs, really excellent corn on the cob we got at a farm stand on the drive down, and a tomato and mozzarella salad with basil I brought from the garden at home. 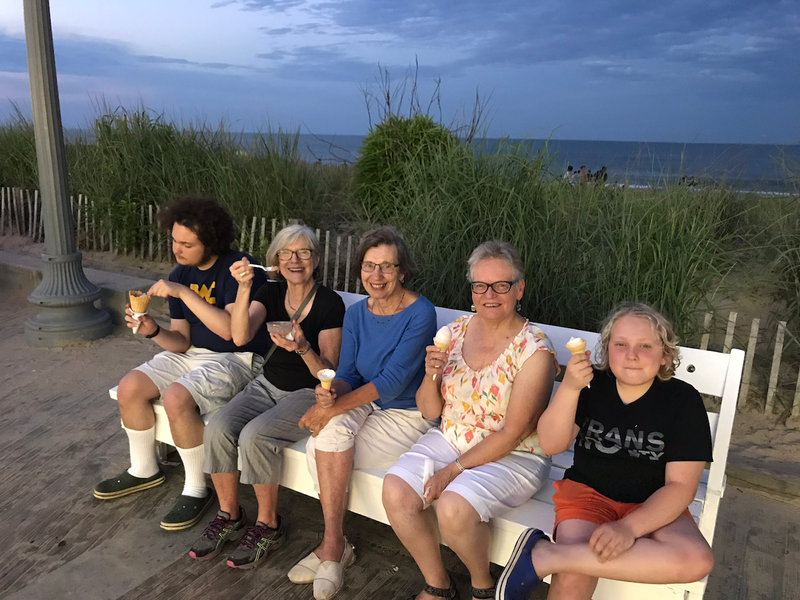 After dinner Noah asked if we had any dessert in the house and we didn’t, so everyone walked down to the board walk (about a half hour away) and got ice cream, frozen custard, and water ice. That last one was mine and I was happy to be close enough to Philadelphia to call this treat by its nonsensical but rightful name and be understood. If you’re not from Philadelphia you probably call it Italian ice. Rehoboth establishments, being frequented by vacationers from the DC area and Philadelphia, use both terms and North noticed one place covered all the bases by advertising “Italian water ice.” I take even more pleasure in saying “water ice” than in calling sprinkles “jimmies,” though I had occasion on this trip to do that, too. We ate our frozen treats on a boardwalk bench under a gorgeous pinkish sky, full of sharply defined clouds. They were beautiful. Everything was beautiful. I resolved to stay off the beach until mid-afternoon because despite diligent application of sunblock I had gotten a mild burn on my shoulders as a result of being out in the noontime sun. I went to town instead where I successfully rented a bike. When the house is a twenty-minute walk from the beach and the boardwalk and downtown are a half hour and you don’t drive and parking’s impossible anyway, it’s really handy to have one. I used said bike to cruise around town, acquiring and iced café con leche, a couple books from the Books of Elsewhere series I’d pre-ordered for North, and some fudge. It was a very satisfactory outing. I returned to the house, made myself a cucumber and mozzarella salad for lunch, sampled the strawberry cheesecake fudge I’d bought, and hung out with the older generation on the screened porch because Beth and the kids were at Jungle Jim’s water park, where they spent most of the day going down slides, riding the bumper boats, and playing mini golf. This is a beach week tradition of theirs, but I’ve never set foot in the place. I tell them it’s against my religion. They regard this statement with some skepticism. I made it down to the beach just before three and Mom joined me shortly after that. I had a long swim—the waves were a little calmer than I’d like but it was still nice—and when I got out we had a long talk, mostly about various relatives and what they’re up to these days. Beth dropped North off at the beach (directly from the water park) around four-thirty. Apparently they hadn’t had enough of water for the day because they made a beeline for the ocean. I stayed up on the sand with Mom until she left and then I joined North in the water. When it got to be around six I thought we should leave so we could get home and shower for dinner, but I had some difficulty coaxing my merchild out of the water. At one point I was on the shore motioning them to come out and they held up five fingers. I wasn’t sure if that meant five minutes or five waves, but I held up one finger. As they stayed in for more than one wave, it must have meant minutes. And then, instead of walking to the towel, they cartwheeled. Carole was the cook that night and she made a pasta salad with feta, tomatoes, and green beans. Although we did have dessert in the house, Beth, the kids, and I made a whoopie pie run into town anyway because sometimes you just need a whoopie pie. 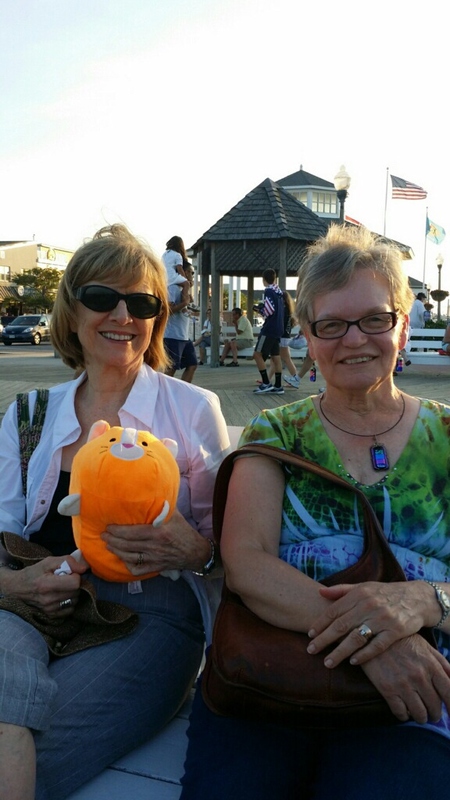 The following day Mom, YaYa, and Carole took the ferry to Cape May for a day trip. As she had been the day before, Beth was glued to the computer, waiting for a decision in the Janus case because when it was decided she would need to direct her union’s online response. That one didn’t come that day, just the awful decision on the Muslim ban. It was just the first of many wrenching political things that happened that week, as you know by now. Every 5-4 decision that goes the wrong way (for instance the Texas gerrymandering case the week before) just fills me with rage about the Supreme Court seat Mitch McConnell stole from President Obama. But this is a vacation post, so I won’t dwell on that. Anyway, no decision meant Beth was free for the day, so she took North to the farmers’ market to get ingredients and then the four of us went to Grotto for lunch. 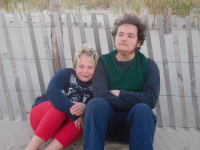 The main reason for this expedition was so Noah could have baked ziti and much to his dismay it wasn’t on the menu, which he considered “a betrayal.” The boy is serious about pasta. Because we had lunch on the late side and we stopped a couple places on the way home, including Candy Kitchen, it was 3:45 by the time North and I made it to the beach, but we were in the water almost constantly until almost six. While we out of the water briefly, we came across three big mounds of sand someone else had made near the waterline and we decorated one of them with dribble castles. 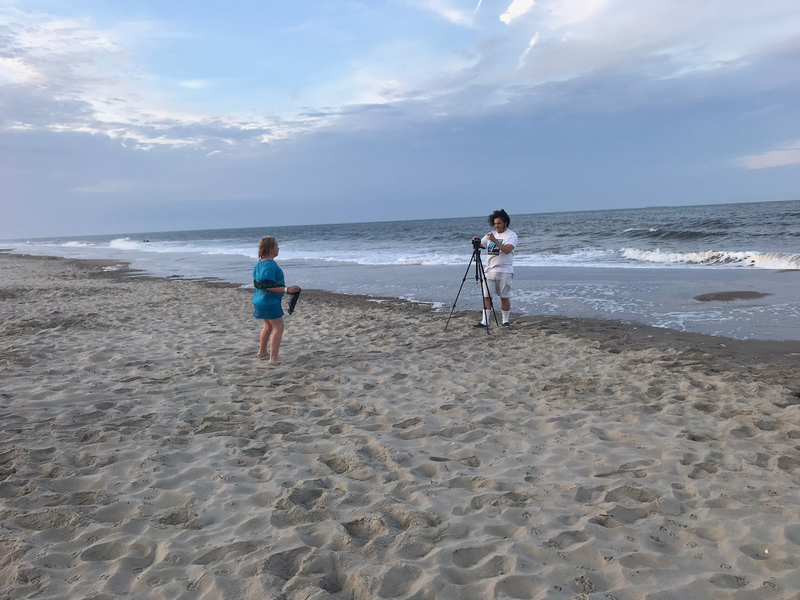 It was a good place to do this because there was plenty of wet sand available, but it was a bad place to do this because the relentless assault of the waves was eroding the base we were trying to build on and taking down other people’s work and ours, too. This was fun until it started to seem like a political metaphor, and then it was less fun. Whoops, there I go again. We took another short break to eat the picnic of fruit, mushroom focaccia, and pretzels with cheese dip North had packed. I ate sparingly because I knew Beth was making her signature beach dinner of gazpacho, potatoes with cilantro-garlic sauce, bread, and a cheese plate. This is definitely a meal you want to save room for. 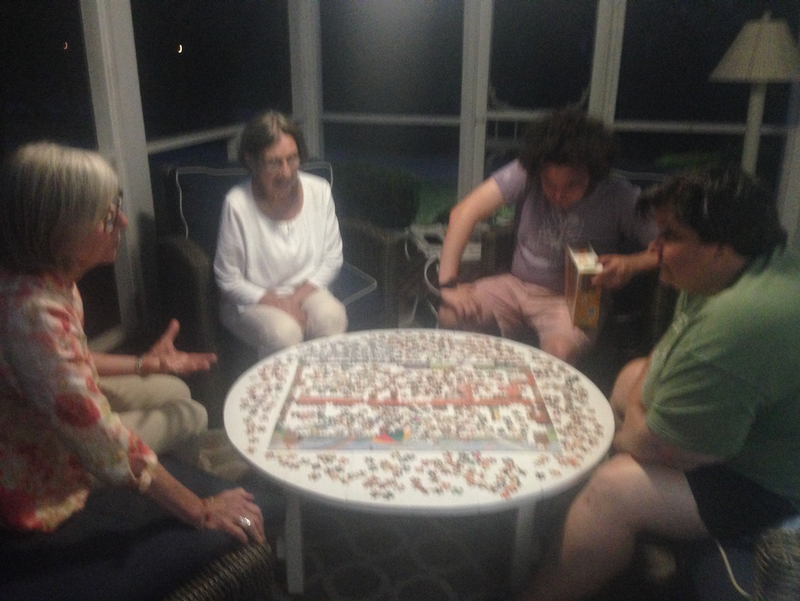 That night Noah, Beth, YaYa, and Carole worked on the puzzle and made significant progress on it. The Janus decision was announced Wednesday. That’s the one that put another nail in the coffin of public sector unions, though I suspect that’s not how Beth was supposed to spin it. 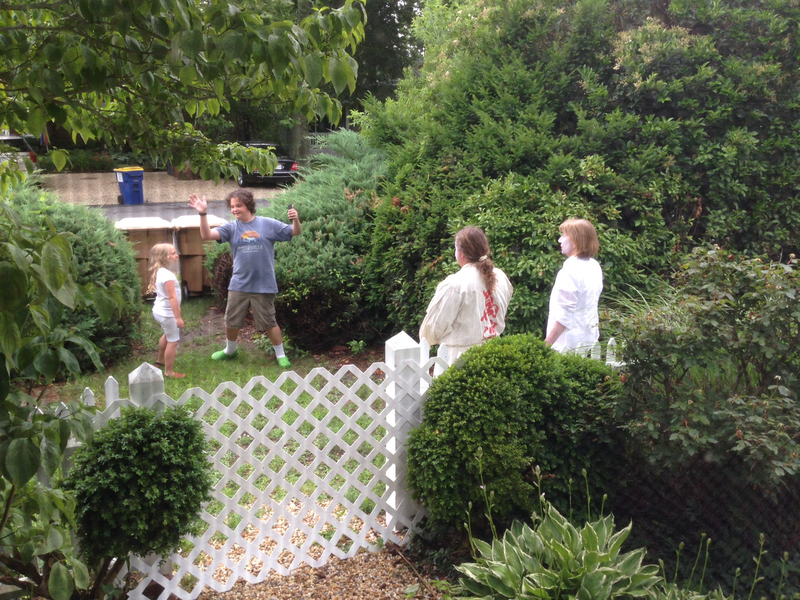 While Beth worked on the union’s response, the kids watched Dr. Who. Mom took them out to lunch at Grandpa Mac’s and then to Funland while YaYa and Carole had lunch with a friend of YaYa’s who lives nearby. It was an overcast day so I felt safe enough swimming in the late morning. With the clouds and the wind, the day was almost chilly so there weren’t many people in the water, but people were on the beach playing with all sorts of balls—footballs, baseballs, lacrosse, and paddle balls—which gave the beach a kind of festive atmosphere. I hadn’t read on the beach yet so I read a Washington Post Magazine and tried to read the Sunday Arts and Style section I’d brought from home, but reading the paper on the beach on windy day isn’t the best idea, so I had to put it away. I took a walk instead, in a loop, first north to a jetty of barnacle and algae-covered rocks and watched the water crash against them and make little whirlpools and channels between them. Then I turned around and backtracked to my towel and beyond it to another jetty. The lifeguard there blew his whistle at me for standing too close to the rocks. I was annoyed because I wasn’t swimming near the rocks, which I understand is dangerous. I wasn’t even climbing on slippery rocks. I was standing on the sand next to them. I’m fifty-one years old for crying out loud. I think that’s old enough to stand next to rocks. Anyway, I was hungry for lunch so I biked back to the house and had leftovers of Beth’s delicious dinner. She was on a work call while I ate, but I sat with her on the deck once she was finished and had her own lunch. We learned shortly afterward that Justice Kennedy had retired and that’s when it started to feel as if the whole damn sand castle had been swept to sea. Noah came home from Funland ahead of Mom and North so instead of dwelling on our real imperiled world, he and visited another imperiled, fictional one, via Song of Susannah. We’ve been reading the Dark Tower series since last summer and we were nearing the end of book six of seven. When North got home we went to the beach. When we first went into the water it was choppy and rough, so when the lifeguards called everyone in at five, I decided to rest a bit while North waited impatiently in the shallow water. North only started swimming past where the waves break last summer but now it’s all they want to do. The current rule is they have to be with me when there’s no lifeguard on duty and they have a hard time understanding why I’d want to do anything but swim at the beach, thus my limited reading time on this trip. When I went back into the water the waves were bigger and more spread out, perfect really. I taught North how to ride up the underside of a swelling wave and glide up over the top, catching air on the other side. They caught on right away and loved it. Back at the house we had YaYa’s famous spinach lasagna, garlic bread, and salad for dinner. It was the night the kids had chosen to film North’s video. Everyone came down to the beach to watch. We were on the beach about an hour, mostly waiting for the light to change to the level of darkness North wanted for the second scene. North also had a costume change, which was effected behind the closed snack bar tucked back in the dunes. Beth and I held up a blanket to make a little tent against its back wall and they changed in there. It was a beautiful twilight with an all-but-full pale orange moon rising over the sea. The kids worked together well and everything went smoothly. That is, it did until everyone had left in the car and I couldn’t find my bike key. I searched all over the beach and the parking lot with the flashlight on my cell phone (it was full dark now) but finally I had to call Beth and ask her to come get me. I left the bike chained to the rack. I was kind of dejected about it, but almost everyone was eating watermelon on the screened porch when I got back and that was cheering. The next morning I returned to the area and searched it thoroughly in daylight. I kept seeing yellow things—vegetation in the dunes, a Ricola wrapper on the sand, but none of them were the bright yellow fob on the key. I also made inquiries with the chair rental guy, the tennis court attendant, and the parking lot attendant but no one had turned in a key. 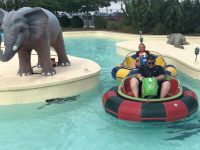 (The lifeguards and snack bar employees weren’t on duty yet.) I decided to kill a little time in town on the slim chance a Good Samaritan would turn it into the bike shop (the address was on the keychain). But after going to the bookstore and a coffeehouse and browsing in a t-shirt shop, I went to the bike shop to make arrangements to get a new key. They didn’t have a record of the number on my lock and I hadn’t thought to check it, so they needed to send someone to the rack to find out and then they needed to send someone to the off-site location where they keep extra keys. By this time it was almost noon and I was meeting Mom on the boardwalk for lunch, so I said I’d come back. By the time we’d finished our lunch—Mom got crab cakes and I got nachos—the key had arrived and to my surprise, there was no fee for the lost key. Atlantic Cycle now has a customer for life in me. 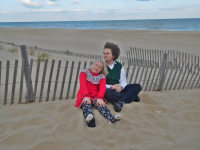 When I returned to the house, the kids were watching Dr. Who again and no one wanted to go to the beach, so I went alone. Beth had rented an umbrella and a chair earlier in the day (it was the only day she went to the beach in the daytime, having taken pity on North while I was off dealing with the bike key situation) and the chair and umbrella were still there, empty, so I sat in the shade and read two short stories from a collection of classic horror stories before I swam. As I was standing in the water, I saw a pelican (the first of four) fly by and it reminded me that while I’d seen countless ospreys, most with fish in their talons and a couple horseshoe crabs, I hadn’t seen any dolphins all week and I’d been looking for them. As the sea was calm and flat and there was no one else in it to block my view—I was even further north than where I’d been swimming most of the week—I decided to just stand still and watch the horizon and then almost immediately I saw a fin, then three, and then one more. They didn’t jump out of the water, but it was eerie, as if something had told me just when to look. I got into the water and swam. The waves were good, but I had to leave soon after the lifeguards blew the five o’clock whistle because we had 6:15 dinner reservations and I needed to get home and shower. Carole was treating us all to Japanese. I got seaweed salad and vegetable tempura, and we all shared a couple orders of edamame. It’s a pretty restaurant with bamboo strung with white lights and several koi ponds both inside and out. Everyone enjoyed their meals. From there we wandered into town where Beth and Noah got ice cream, North got an açai bowl and I got a ginger lemonade. We split up and Mom, the kids, and I walked home the long way, along the boardwalk. That night YaYa, Carole, and Noah finished the puzzle. This was also the day we learned with a heavy heart about the five journalists who were killed at the Capital Gazette. The news would just not let up this week. Everyone spent the morning at the house—I was reading with Noah, doing laundry, and hanging out with my mom, who was packing. She had a flight out of Philadelphia the next day and was leaving to stay overnight with another friend. Mom and I ate leftovers for lunch and then watched about a half hour of Into the Woods with North, who was watching it in preparation for drama camp. They were thinking of trying out for Little Red or Rapunzel. After Mom left, I was sad because she lives on the other side of the country, and it could be a year before I see her again. Noah cheered me up by coming to the beach with me. Like Beth, he had not been to the beach in daylight all week. (I don’t know how I convince so many people who aren’t beach-lovers to come to the beach with me for a week every year, but I appreciate the fact that they do.) We had a dip and relaxed on the sand. Eventually North joined us and we all went back into the water in various combinations. At the end it was just me and North. Our last wave knocked us both over (something similar happened to Noah earlier). I never like the last wave to be a bad one, but the lifeguards were blowing the whistle and to get in again we’d need to wait for them to drag their chairs up the beach and leave, and we needed to get home to shower for dinner, so that was it for the day. We had pizza at Grotto and then some people got dessert and North and I split off to go to Funland, where we rode the Haunted Mansion, which is still a little scary for North. When we checked the screen with the souvenir photos they try to sell you afterward they said we couldn’t buy it because “it makes me look bad,” by which they meant slightly spooked in contrast to my calm face. I thought about how when they were eight, they wanted a picture of themselves cowering into me with their eyes shut tight and their arms thrown protectively over their face because it proved they’d been inside. The Haunted Mansion cars have two routes, the only difference being sometimes they go out onto a balcony where you can briefly see the boardwalk and the ocean and people on the boardwalk can see you. This is the less common route, so we were both happy when the car went out there and people on the boardwalk waved. We had enough tickets left for North to ride the Free Fall and the Viking ship and then we walked on the beach. When I warned North not to let their phone get wet as they waded in the water, they felt for it in their pocket and couldn’t find it. It was in the sand, not far away, but I think that was a bigger scare for them the anything in the Haunted Mansion. As we walked home on the boardwalk they were considering the pros and cons of the two parts they wanted (Rapunzel: better singing, Little Red: better acting). Then they sang part of a song and an older woman stopped us to compliment North’s voice. I had a short swim, about a half hour, which was as long as I dared to stay in the sun so near noon. 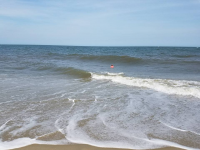 I was in the most crowded part of the beach, right in front of Rehoboth Avenue, and it was a hot, sunny Saturday morning, and the water was calm, almost like a wave pool, so the ocean was packed with people. This was quite a contrast to the beach where we’d been swimming all week, which always had people on it but never crowds. Still, I was feeling a kinship with everyone standing around in the water together—the little black girl with the adorable Afro puffs, the people tossing footballs back and forth in the water, the middle-aged couple and their college-age daughter who just seemed really happy to be spending a weekend together and were all wondering if the daughter could get another one off work so they could do it again. The wildlife was different here, too. Instead of the countless ospreys with fish in their talons I’d been seeing all week, there was a gull with a French fry flying over our heads instead. I wouldn’t want to spend most of my beach time in the more populous part of the beach, but it has its charms, too. Once I’d torn myself away from my last ocean swim, I got a bucket of fries and brought them to the alley of shops and stalls where we were all meeting for lunch. I bought orangeade for everyone, actually finished up a punch card and got a free drink, which was satisfying after Smoothie King refused to honor my punch card back in May. (I am still bitter about this.) After lunch the kids and I made our final purchases from Candy Kitchen and we went to put our feet in the water probably for the last time until we return in November for our annual Thanksgiving weekend trip. I’m hoping (though not necessarily expecting) that we will be celebrating happier political developments in the midterm elections that will take place a couple weeks before that. That would truly be a reason to give thanks. Staying in the picturesque little town on a mountain lake in upstate New York was hardly our last resort. Beth chose it because it was most of the way to Burlington, Vermont, where we’d be touring Champlain College the next day and because of the mountains, although the hokey, brightly colored statuary (Santa Claus, Paul Bunyan, etc.) you often see in family-oriented summer resorts was a bonus. We had a late dinner at a Chinese/Japanese restaurant and then it was time for showers for two of us, a bath for one of us, and for bed for everyone. North was disappointed it was too late for a swim in the hotel pool, especially since for them hotel pools were one of the selling points of the first portion of the trip, which would be focused squarely on their college-bound brother. 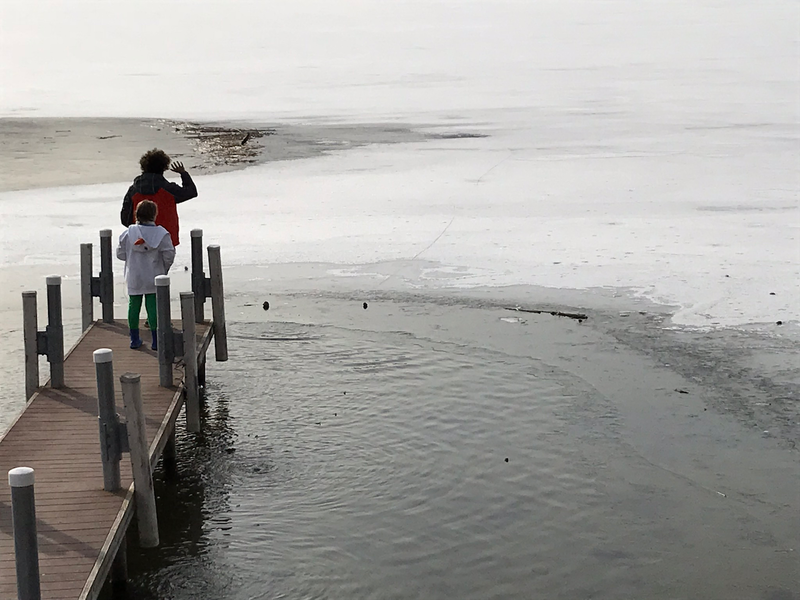 Beth and North managed to squeeze in a swim the next morning between breakfast in the hotel restaurant and a brief walk to the mostly frozen Lake George, where the kids stood on a dock and threw rocks at the thin edges of the ice. When they ran out of rocks, Noah ran back to shore for more. It reminded me so strongly of how much both kids loved to throw rocks at ice when they were little (and Noah’s complicated scoring system for this activity) that I couldn’t help but smile at Beth. It was like getting a fleeting glimpse of our little boy before we spent two days imagining our young man. We got coffee and tea from the hotel coffee bar and hit the road at 9:30. We took the scenic route around Lake George but it was hard to tell when it ended because the whole drive to Burlington was scenic, full of tall evergreen trees rising from the snowy woods and mountains ringing lakes. We got to Burlington in time for a very tasty lunch at a ramen place and then reported to Champlain College for a presentation by an admissions office administrator and a tour of campus by current students. We opted to take the shuttle down to a lakeside part of the campus where the Emergent Media Center is located because Noah is interested in both the film and computer science programs. Champlain is a small college in a stunningly beautiful location, in the mountains very near Lake Champlain. The larger University of Vermont is in the same town so Burlington has a nice, funky college town feel. The campus is lovely, too. First-year students live in nineteen Victorian mansions. The rooms are all different shapes and a far cry from your standard cinder block-walled dorm room. We knew Champlain had a pre-professional focus but I don’t think any of realized how pre-professional it was until we heard the presentation. That could be a plus or a minus (or both) but it’s definitely something to think about. We were done by three-thirty, so we headed back to the hotel room and North, who had sat patiently through a boring (to them) presentation and walked around campus a bit hobbled from a twisted ankle got to swim for the second time that day. Beth and I partook of the pool as well—I swam laps for almost an hour in the tiny pool—and we all used the hot tub. We hit the road shortly before nine and drove to Boston where Beth navigated heavy traffic amid confusing directions from Siri. We arrived in time for a quick lunch at a taqueria around the corner from Emerson College. Then we did the admissions presentation/tour thing again. Being in downtown Boston, Emerson has a very different, more bustling feeling than Champlain, so that made for a nice contrast. The buildings that house the classrooms, labs, offices, and dorm rooms are all high rise buildings interspersed with non-college buildings along one city block. There’s no real campus, but it is right on Boston Common, so there’s nearby green space. Like Champlain, Emerson also has a pre-professional focus, but in addition to the communications, media, and film classes that attracted Noah there’s a robust performing arts program that piqued North’s interest. They’d been prepared to be bored again but by the end of the tour, which was conducted by two very animated performing arts majors, they were saying they would like to go to Emerson. All week I’d been seeing Facebook posts from people I know with high school juniors who were doing exactly what we were doing, which made it feel like a communal experience. (Going into Emerson we also ran into a boy who’s been in all three magnets Noah’s attended, ever since fourth grade. I guess it’s not too surprising, as the last two magnets have been communications-focused.) Some families had more ambitious itineraries than we did—we know one family that did seven schools in five days, but two felt like enough for now. Our next school will probably be St. Mary’s (Maryland’s public honors college) later this month, so Noah can see a more traditional liberal arts school, but for this trip we were done touring schools. It was hard for Noah to get started choosing schools and I was just glad he’d begun the process. Now we could relax a little with the R&R portion of our trip. We left Boston immediately after the tour because we were heading for Cape Cod, where we’d spend the next three nights and two days. On the way to the Cape, we stopped to see Plymouth Rock and to eat dinner at Friendly’s. 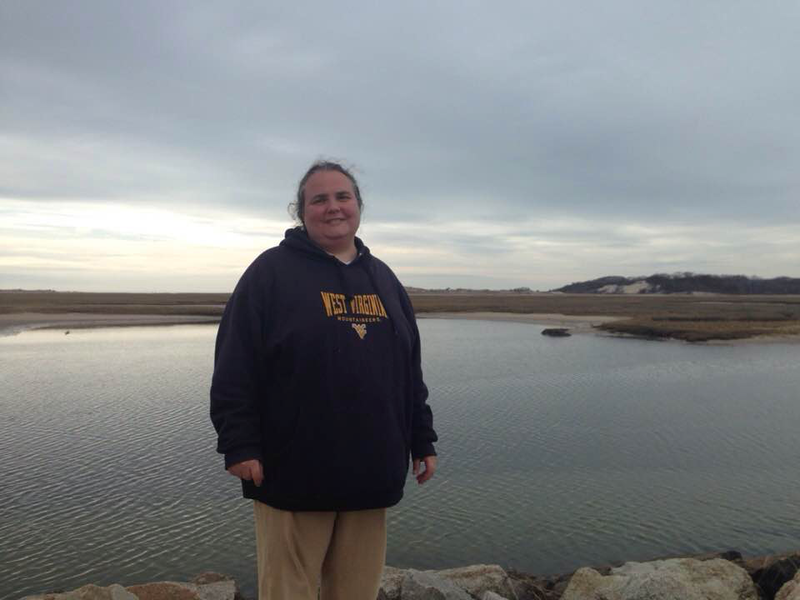 We were staying in North Truro, which is close to Provincetown. 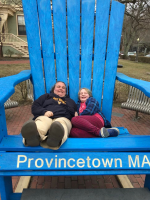 Provincetown is a special place for Beth and me. We road tripped out there the spring break of my junior and her senior year of college, exactly thirty years ago, and then in the nineties and in 2000, we spent several Memorial Day weekends there because Beth was working for HRC and their retail store used to open for the season that weekend. Beth would help set up the computers in the store while I wandered the town and the beach. Often we stayed in houses with friends of hers from HRC. It was always a fun time. 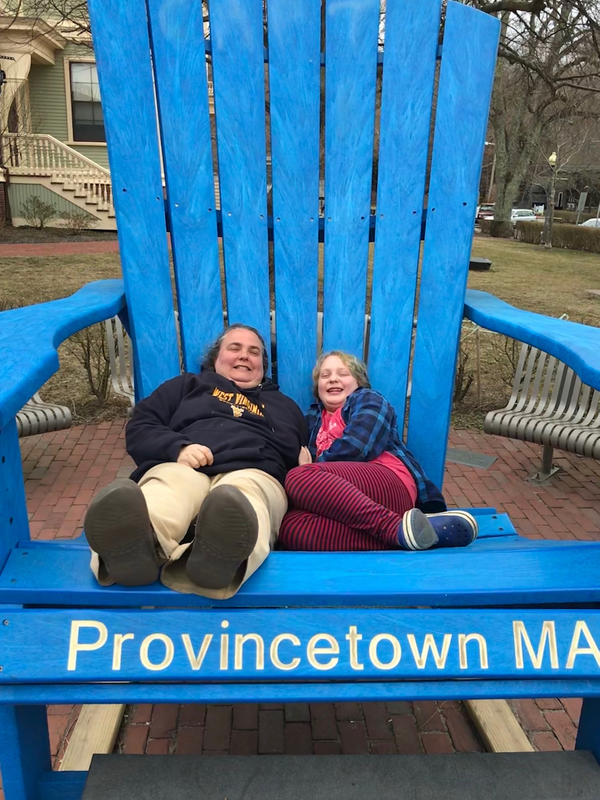 The last time we were in Provincetown, Beth wasn’t working at HRC anymore, but we came up again for Memorial Day weekend in 2004 when Noah was three, to hang out with HRC folks during their off hours and to play with Noah on the beach. The first night we were in our beach house the thermostat went haywire and sent temperatures in the house soaring to ninety degrees. We had to open the windows in the middle of the night (it was in the thirties outside) to try to get the house down to a reasonable temperature until Beth could apply herself to the problem the next morning. She did fix it and the house, a charming, low-ceilinged, nineteenth-century home, was comfortable the rest of our stay. That morning while we were waiting for the house to cool down, the kids and I enjoyed the somewhat cooler enclosed porch. It was a sunny day in the forties, but it felt warmer. There was mist over the water that made it hard to see where the land on either side of the water ended and also where horizon was. We walked along the sand a bit and then got supplies for a picnic at a little corner grocery near the house. All four of us got in the car and drove to the Truro Lighthouse, where we ate bread, cheese, pickles, olives, chips, macaroni salad, one orange shared between us, and chocolate-covered cashews, all spread out on a bench on an observation platform at the top of a cliff overlooking the ocean. Next we drove to Head of the Meadows beach where we rambled on the beach, finding pretty rocks until Noah asked to go back to the house and Beth drove him there, then swung back to get me so Beth, North, and I could wander through Provincetown, window-shopping in the mostly closed stores. We did find an open bakery (not the Portuguese bakery we used to frequent—it was opening for the season in two days) but somewhere we could get hot drinks and baked goods. And then we found a candy store where we needed to buy chocolate rocks, and molasses taffy, and lemon and maple fudge and I don’t know what else. As we were sitting outside the store, a passerby informed us Spiritus (our favorite pizza place in P-town) was having its annual free slice day. We were too full to have a slice each, but we walked over there and got one to split between the three of us. We also visited the long causeway of boulders that goes to the beach. I used to love this walk (which takes about forty-five minutes each way) but North wasn’t up to it, so we walked far out enough to inspect a recent shipwreck and turned back. We went back to the house and I tackled the laundry we’d accumulated thus far on the trip and then we all went out to dinner at a nice restaurant where we got vegetable alfredo, mushroom ravioli and curried tofu with apple chutney. The next morning I was out of bed early, by 6:35, because rain was predicted to start as early as ten and possibly last all day and I wanted to go for a walk on the beach. Well, it never did rain, other than a few sprinkles, so I got in three walks. The first two were at the bay beach. It was called Cold Storage beach. I’m not sure why. I wondered if people dug root cellars into the sandy cliffs back in the day. It was a cloudy, windy day even though it didn’t rain, and it felt colder than the day before. I had to keep moving so as not to get chilled. In between the two walks I went back to the house to warm up and fold laundry. When I returned, the tide had come in considerably and there wasn’t much room to walk between the water and the base of the cliffs. I found a platform in front of one of the boarded up shacks (storage units? changing rooms? showers?) on the beach. It was satisfying to be standing there as the biggest waves went right under the boards where I stood, as close as I could get to being in the water this time of year. On the way back to the house, I stopped by the little grocery store and got a baguette and some maple-smoked cheddar cheese that had tempted me the day before. With these additions, we had a smorgasbord lunch of picnic and restaurant leftovers. 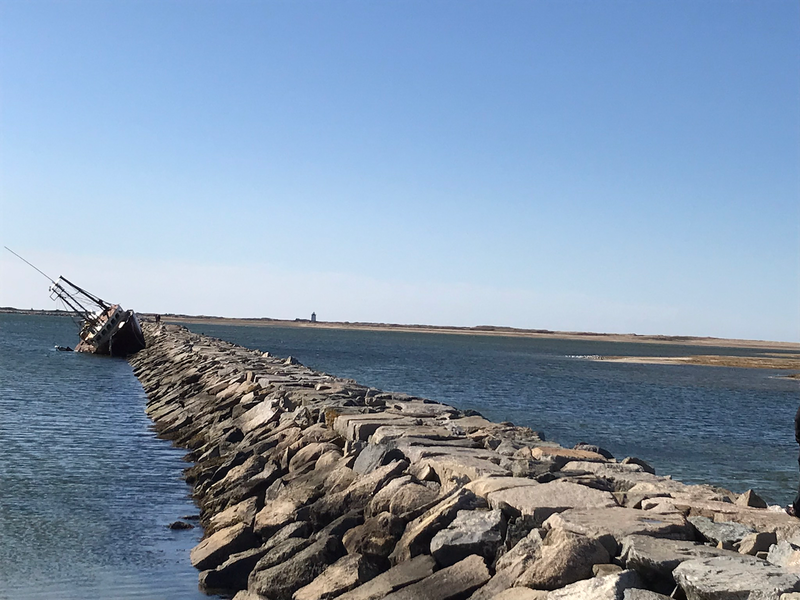 After lunch, for my third beach jaunt of the day, Beth drove me to Race Point and dropped me off so she and North could go browse the shops in Provincetown again. I spent over two hours walking and sitting. It’s a broad beach on the ocean side with a lighthouse and big dunes. After I’d walked a bit, I found a cleft in them and I thought it might be sheltered from the wind in there and a good place to sit if you could still see the ocean, but it turned out to be windier than the beach. I was intrigued by the shapes the wind had sculpted into the sand there and I considered exploring, but sand was blowing in my face, so I left. Once North was in bed, Noah and I read a little bit of Wolves of the Calla. We’d been so busy we hadn’t read much (only once in the hotel in Lake George) so that was nice. In the morning we packed and left. There was a chalkboard in the kitchen where I’d written “SDL was here,” with a peace sign underneath shortly after we arrived. I added “Now she’s not,” with a frowning face underneath. Shortly before we left I regarded the stones I’d collected on the beach, a couple that were translucent white and peach when wet but didn’t look as impressive dry and a few speckled ones. I decided to leave them at the house. We went into town and picked up pastries at the Portuguese bakery, which had just opened that morning. I knew I used to have a regular order there but it’s been nearly fourteen years so I wasn’t sure what it was. I remembered it was one with a Portuguese name, so I chose two, a tiny tart filled with ground almonds and a sweet potato-filled pastry. We drove out to the causeway to eat. Once I bit into the sweet potato pastry I knew I’d picked the right one. We lingered a bit, walking out on the rocks, inspecting the shipwreck up close again and admiring the water and the dunes. No one was in a hurry to get on the road, but a little before ten we did and after a seven-state, thirteen-hour, too-many-podcasts-to-count drive, we were home. “Happy Thanksgiving Eve,” Beth said to me as she came back into the bedroom after her shower on Wednesday morning. I was still in bed looking at my phone. “Happy Birthday Eve,” I responded. Beth’s birthday was on Thanksgiving this year and we were kind of stumped about when we should serve her cake. 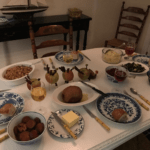 For breakfast on Thanksgiving morning, before we drove to Rehoboth for our Thanksgiving dinner and a weekend of Christmas shopping? As an afternoon snack when we arrived? 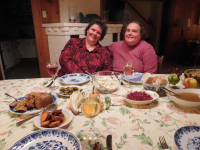 I checked to see when her birthday had last fallen on Thanksgiving so I could consult my blog and see what we’d done, but, alas, it hadn’t happened since 2006 and I started writing this blog in 2007 so the answer was lost in the sands of time. North: That’s it? No sparkles? Beth: Do you recommend sparkles? North: I always recommend sparkles. For Beth’s pre-birthday dinner, at her request, I made breaded tofu sticks, tater tots, and homemade applesauce. I also made cranberry sauce and brandied sweet potatoes for Thanksgiving and mixed a little of the cranberry sauce into the applesauce. After dinner, Beth took her shift in the kitchen, making stuffing and mushroom gravy. In the morning, I made pumpkin-pecan muffins and served them with scrambled eggs, clementines, and vegetarian bacon and sausage. Before we ate, Beth opened her presents: fancy olive oil in a ceramic jug with multicolored stripes, a Christmas ornament shaped like a pierogi, and an assortment of dark chocolate bars. We left for the beach around 10:30 and arrived at our rented beach cottage about four hours later—we had to make a lot of pit stops. We explored the house, admiring the charming alpine slope of the ceilings in the attic bedrooms and in the living room. Then we unpacked, made up the beds, and by 3:15 I was on the beach. Afternoons are short in late November so shadows were already long in the golden light. The waves that were tall enough not to be all foam were translucent at the tips. The angle of the sun hitting the sea spray was such that there was a tiny rainbow with almost every wave. Once I’d noticed a couple of them, I couldn’t stop seeing them. It was magical. I took a long walk. At the south end of the boardwalk, where there are beach houses, I could smell wood smoke. In the middle, where it’s commercial, I could smell French fries, even though none of the food stalls was open. I guess that aroma lingers. At the north end, where the big hotels are, I smelled smoke again, presumably from the fireplaces in their lounges. The only business open was Victoria’s, the ground-level restaurant at the Boardwalk Plaza Hotel, where people were eating Thanksgiving dinner behind the big windows that face the boardwalk. I was not alone on the beach, far from it. I guess people were working up an appetite for their dinners. Over the course of the weekend while on the beach, I’d see countless parents photographing their children dressed in everything from church clothes to Christmas pajamas, a bride and groom in full wedding regalia, and a group of a half-dozen middle-aged to elderly men releasing star-shaped balloons and embracing each other, which reminded me that on the other side of the country, my mom and a group of relatives were gathering this weekend to scatter my stepfather’s ashes in the Pacific Ocean. Back at the house, Beth and I heated up the food we’d made at home, and she mashed potatoes and made a fire. We shared our gratitudes and ate. We are thankful for: each other, the beach, the fact that American democracy has not completely collapsed and all the people working to keep that from happening, smiles, cranberry sauce, and the Internet. We ate: vegetarian turkey, stuffing, mashed potatoes with mushroom gravy, Brussels sprouts, rolls, and cranberry sauce. After a break for dishwashing and digestion, we ate pumpkin and apple pie in front of a fire and watched A Charlie Brown Thanksgiving. 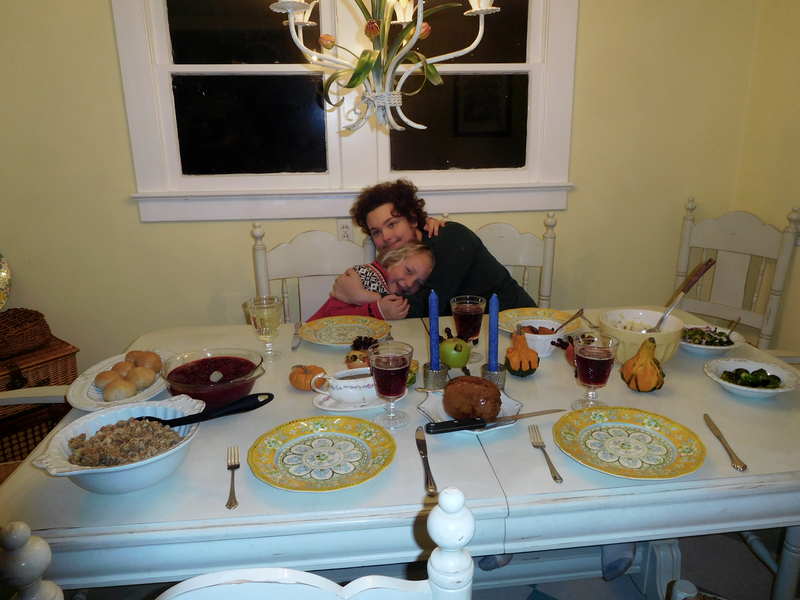 Before we went to sleep that night, I said, “Happy birthday,” to Beth and she said, “Happy Thanksgiving,” to me. I am thankful for many things, of course, but top of mind is the fact that Beth was born the day before Thanksgiving fifty one years ago, that the beach is just a few hours away, that we can afford to go there two or three times a year, that we can afford to buy Christmas presents for each other and our loved ones, that Noah had much less homework than usual and so had some free time, that the weather was lovely all weekend, so sunny and mild that I spent hours roaming the beach and boardwalk every day for four days in a row, and for our family togetherness whether we’re collecting shells on the beach, singing at the annual sing-along and Christmas tree lighting on Rehoboth Avenue, browsing in the little downtown shops, eating at our favorite restaurants, or watching Christmas specials together in front of the fires that Beth and North built. (Saturday evening North lit one all by themselves.) That bond will get us through the hard things in life. Of course, there are hard times and sad times and we don’t always have everything we’d like. North decided this year they are too old to sit on Santa’s lap in his little house on the boardwalk, but they couldn’t quite let go of the tradition completely, so they left a note in his mailbox. Inspired by that, I left my own anonymous note in the mailbox Sunday morning, asking for something dear to my heart but unlikely to happen—and no, it wasn’t Trump’s impeachment. It felt somehow therapeutic to leave the folded-up piece of notebook paper in the little metal box and walk away down the boardwalk. 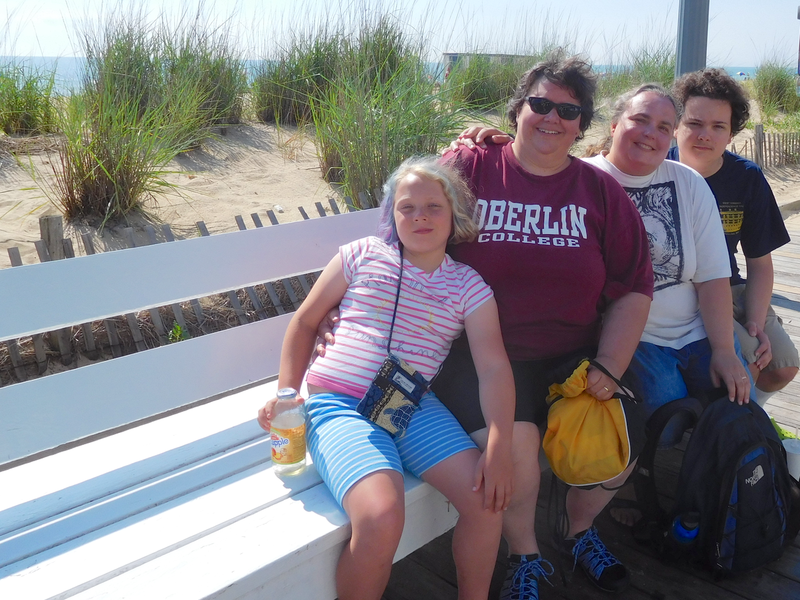 For the first time in nearly two decades of extended family vacations in Rehoboth, we arrived before check-in time. This must have been satisfying for Beth because she comes from a family of early arrivers and I come from a family of late arrivers and in general, when you mix these groups the late arrivers prevail. But we managed to leave the house earlier than planned and there was surprisingly little traffic on the Bay Bridge, so even with a lunch stop our family of four plus Beth’s mom Andrea arrived in Rehoboth at 2:15. We had some time to kill before we could get into the house at three. I went to the beach and put my feet in the water while everyone else went into town for cool drinks. Eventually we settled into the house and Beth went out for starter groceries and the West Coast contingent—my mother, sister Sara, and four-year-old niece Lan-Lan—all of whom had just spent two days in Philadelphia visiting with old friends—arrived and we socialized and Noah and I made a dinner of burgers, hot dogs, corn, fruit salad, and potato salad. Sara tried to keep Lan-Lan from adjusting completely to East Coast time so the girls had the same bedtime much of the week (until biology eventually took over). 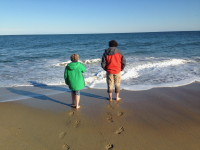 After they were in bed and Beth and Noah were settled in front of an episode of Dr. Who, Mom and I walked down to the beach and I got my feet wet again. June and Andrea went for an early morning walk and were back before the late risers were awake. Much of the morning was occupied with menu planning and grocery list making and grocery shopping. June played with Lan-Lan much of the morning while Beth, Noah, and Andrea started a thousand-piece lighthouse puzzle. I made the girls lunch and took them to the beach so Sara could work. The whole week was something of a busman’s holiday for her—she’s self-employed and this often happens. The weather at the beach was perfect—low eighties, sunny, and not too humid, with cumulus and cirrus clouds scattered across a deep blue sky. We were there four hours and for most of that time, June was swimming in the ocean by herself while I stayed on shore with Lan-Lan, who was alternating between jumping happily in the surf and digging in the sand. We left the beach at 5:30, all three of us somewhat reluctant to go, but it was getting on dinnertime. No one had chosen this day to cook for the group, so some people cooked for themselves and others ordered takeout and we all ate a makeshift meal together. I might have been wrong about the weather being perfect. A few more clouds might have helped. Despite being conscientious about re-applying sunblock, June’s face, neck, shoulders and back were badly burned and my shoulders burned, too. June’s ear, now exposed by her brand new asymmetrical hair cut was the worst casualty. Fortunately, Lan-Lan didn’t burn at all. I must admit I was hoping Lan-Lan would spend more time in the little kids’ rides because all week I was feeling a little nostalgic for when my kids were her age (especially when I’d see her in June’s hand-me-down pajamas or shorts or when I’d read Where the Wild Things Are to her). 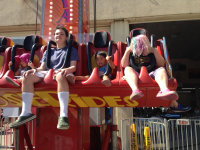 But Lan-Lan is more of a daredevil than either of my kids were at four and after a trip on the sedate airplanes, she wanted to go on faster rides. The race cars were a big hit—she did these three times and she also tried the little Ferris wheel, the helicopters, and the Freefall, which my kids didn’t ride until they were ten and six, respectively. She looked a little nervous on it but said she liked it. Next, she wanted to go on the swinging Viking boat. This was also scary, more so than the Freefall, and June had to put her arm around her when it got to be too much. Both Sara and I thought the netted climbing structure would be a good way to calm down after all those exciting rides. There are two entrances—one for little kids and one for big kids. Lan-Lan did the little kid course while June did the big kid course. 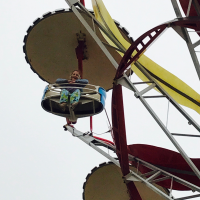 But then we discovered Lan-Lan was in the height overlap so she went through the big kid course, too, but she got stuck at the top, twenty or thirty feet above the ground, couldn’t figure out the way down, and started to cry, so we sent June in after her. 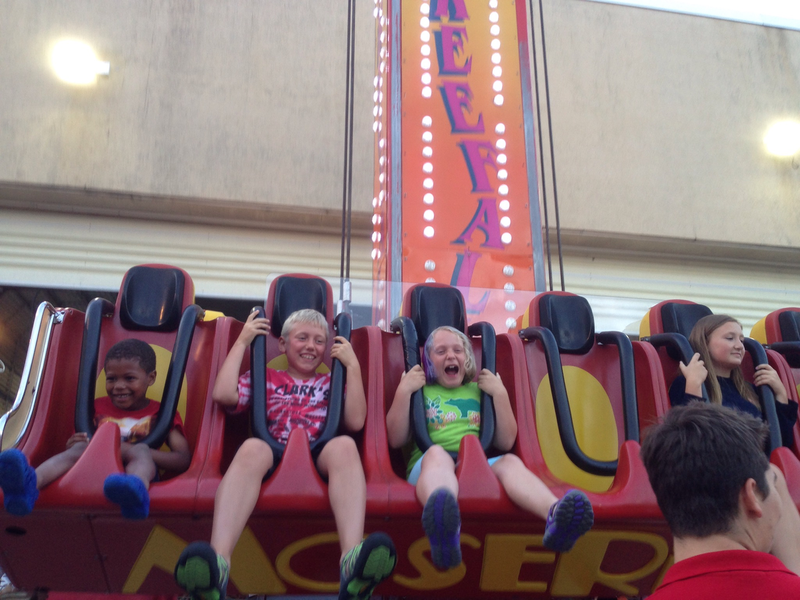 Lan-Lan found her way down before June reached her but she was shaken up, so we tried the swings as the final ride. That helped some, but Sara says she was still upset in the car. Noah, June, and I walked home, stopping at Candy Kitchen, and then taking the scenic route along the beach. We were walking along the waterline for twenty minutes and no one got soaking wet. That never happens with preschoolers. There are advantages to having older kids, even if I sometimes miss my little ones. Mom was making a black bean-sweet potato stew when we got home, so I helped her finish it while we listened to a fifties music Pandora station. After dinner, Lan-Lan had her first taste of fudge—Sara is strict about sugar—and it was a hit. Often when Lan-Lan was allowed a small treat later in the week, she chose the strawberry fudge (we had four flavors in the house). Andrea, Beth, the kids and I went out to get bagels and crepes on the boardwalk Tuesday morning. While we were there June and I ducked into a shop and got June a peach-colored rash guard that coordinated with her suit, so she could swim that afternoon. When we met back up with Andrea, Beth, and Noah we learned the cook at the crepe stand had undercooked the eggs in Beth’s crepe and then did the same to Andrea’s, so they got a refund and went elsewhere. My crepe and Noah’s were safe, being fruit-based, so we ate them. Noah finished before I did and he went with Beth and Andrea to get a second breakfast. Once they were gone, I heard another customer complaining about uncooked eggs. I thought the employee should just start telling people she was out of eggs until someone could retrain her. Late that morning, Mom took June to get pedicures and lunch at a Mexican restaurant. They both came home with dark purple toenails, in slightly different shades. In the afternoon, we drifted down to the beach in groups. Andrea stayed behind to make dinner. Beth, Noah, and I got to the beach first and we all went into the water, which was very calm and in Noah’s rather vocal opinion, too cold, but he stayed in a half hour until he and Beth returned to the sand and I stayed a little longer, first alone, then with June when Mom, Sara, June, and Lan-Lan arrived. Our holes were empty like a cup. We’d all left the beach by six, then we showered and devoured a whole pan of Andrea’s spinach lasagna as well as half of another pan of the gluten-free version she made for Sara. After dinner, Noah and June settled in with a bowl of popcorn and an episode of Dr. Who, while Beth and I left for a dessert date. We rode our bikes into town in the twilight and got a milkshake for her and a whoopie pie for me and ate on the boardwalk. It was short, but it felt romantic. Then bringing home a brownie and a cookie for our mothers, we biked home and stayed up late talking with Andrea, Mom, and Sara on the screened porch. Sara marveled that we’d left our kids to put themselves to bed, trying to see her own future in this. The next morning Mom and Andrea went to see an art exhibit and a historic property while Beth and Sara took all three kids to Jungle Jim’s water park. I did not attend, as going to water parks at the beach is against my religion. (In fact, it’s one of the only tenets.) Instead I biked into town and picked up a book I’d ordered from Browse About and then hung out on the boardwalk for a while until it was time to meet Mom for lunch at a boardwalk restaurant. 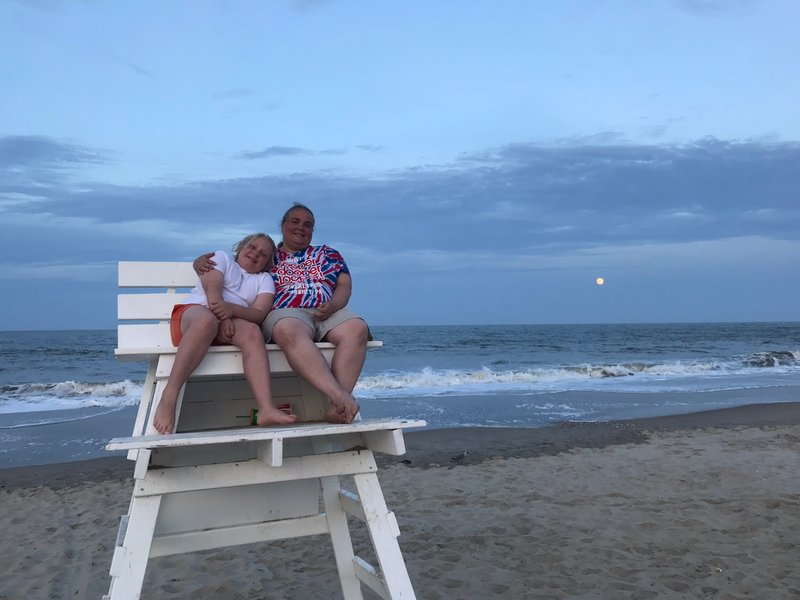 I went to the beach in the late afternoon, alone because Andrea was taking June to high tea at a hotel, Sara was working, Lan-Lan was at Kids’ Cottage, Beth was cooking, and Mom and Noah felt like relaxing at the house. The day was beautiful again—we had an almost unbroken string of beautiful days. It was in the high seventies and sunny. The sea was calm and I was starting to worry I wouldn’t get to swim in waves this week. That evening Beth served her signature beach meal—gazpacho, salt-crusted potatoes with cilantro sauce and fancy cheeses. Then Beth and I made another dessert run, this one more hurried because we wanted to get June her cinnamon bears before bedtime, though we ended up letting her stay up past bedtime anyway, because she and Grandmom were deep in conversation. Meanwhile, Beth, Andrea, and Noah worked on the nearly completed puzzle. Sara had been working all week and Thursday morning I finally broke down and asked if I could help with anything, but she said no because what was left was editing my work from the previous week and a project for a new client and it would take too long to bring me up to speed for that. Noah and June played with Lan-Lan a long time that morning, pretending to be a family of performing octopi (they hummed different songs) and making cards for Sara and me with stickers. I was still trying to keep out of the sun until mid-afternoon, so once the kids were finished playing with Lan-Lan, we read the books we’d been reading all week, New Lands from the Chronicles of Egg with June and The Other Wind, the last book in Ursula LeGuin’s Earthsea cycle with Noah. We finished it that day. Sara did manage to get to the beach in the late afternoon. She came with Lan-Lan, who had spent a few hours at Kids’ Cottage, and Grandmom and June, who had been resting at the house. Andrea came down just a little before they did. Beth had been reading on the beach and I’d been swimming around an hour in better waves. They were still smaller than I like and a bit closer together, but it was a good swim. When June got to the beach we swam some more, but eventually I left her alone in the water and sat in Sara’s beach tent with Sara, where we sheltered from the sun and blowing sand and let Lan-Lan bury our feet in the sand. Then she’d pour water on them. Once when she did this, my big toe was exposed. “That’s just how life goes,” Lan-Lan told me. While thus engaged, I realized I no longer watch June every minute when she’s in the water alone (though I think Beth does). She’s gotten to be a pretty strong ocean swimmer. Everyone noticed how confident and comfortable she seemed in the water. Sara made eggplant parmesan that night and then we went to the boardwalk for dessert. We split up and there was a mix-up with June’s mermaid shake. It comes with a cloud of cotton candy and Swedish fish and a strip of rainbow-striped candy on top and I’m not even going to tell you how much it cost because it’s a ridiculous amount to pay for a milkshake. Anyway, Beth and Mom both bought one not realizing the other was doing the same. We’d told June we were going to buy her shake when she left the house in Sara’s rental car with Mom, so Beth was irritated. While June and I were on the beach, leaving the rest of the party on the boardwalk, I told June she should probably apologize to Beth because she was supposed to pass the message on to Grandmom about not buying the expensive shake. She told me she already had and offered to pay for the extra shake out of her allowance. I told her that was very mature of her, even though Beth said she didn’t have to do that. Sometimes kids grow up when you aren’t expecting it. Friday Sara didn’t work and she went to rent a bike so we could go on a bike ride on the Gordon’s Pond trail in Cape Henlopen State Park. While she was doing that I took the kids to Browse-About because Mom had given Noah some money to buy a book. He selected The Coldest Girl in Coldtown, a YA horror novel. I’ve read some of the author’s middle grade books with both kids, but this one looks considerably darker. June wanted to tag along and when she found there’s a new book in the Serafina series she wanted it, so I bought it for her. It was a hot day, the first real hot one since we’d been at the beach so we got smoothies for the walk home. Beth, Sara, and I set out for our bike ride shortly after lunch, with Lan-Lan riding on the child seat of Sara’s bike. This was a new experience for Lan-Lan and she was enthusiastic about it. We biked about an hour, most of it through a pretty salt marsh full of water birds, including a few egrets, which are Sara’s favorite bird. Lan-Lan didn’t like the smell of the mud, but Sara said it reminded her of catching salamanders in puddles near the lake in the Berkshires where we vacationed as kids. When we got to the ocean, we were hot and ready to get wet. The waves were about the same as they had been the day before during my first swim, but the second time I went in they’d gotten bigger and spaced out and I had the best swim of the week, including two waves I sailed up and over, dropping down the other side after just a moment with the top half of my body airborne. Lan-Lan was getting hungry and Sara had forgotten snacks, so she approached a mom with a large group of kids and asked if she had anything and she came back with a feast of goldfish, cheese sticks, and watermelon. That’s something I could never do, but it’s the kind of thing that often works for Sara. Meanwhile, Beth spied a water ice truck parked up near the jetty and she and I snuck off to get a sugary treat Lan-Lan wasn’t allowed. I could have been smoother, though, as I came back with vivid blue stains on my shirt, arm, teeth, and lips. “Why your mouth blue?” Lan-Lan wanted to know. I told her I drank something that made it blue and that seemed to satisfy her. On the ride home, Lan-Lan fell asleep. She’d been up past her bedtime on the boardwalk the night before and she was tuckered out. But we still had a big night ahead of us. We were going out to dinner—Mom and Sara split off and went to a seafood place while the rest of us went out for pizza and Stromboli and gelato at Grotto. Lan-Lan was beside herself about the pizza, the gelato, and the balloon they give kids as you leave. It was a completely satisfactory dining experience in her opinion. From there, Beth, Andrea and Noah went home and I took the girls to Funland where we met up with Mom. June and I were going to the Haunted Mansion and Mom was going to take Lan-Lan to revisit some of her favorite rides while Sara read a magazine on the boardwalk. While we were in the Haunted Mansion, our car went out on the balcony and we got a glimpse of the boardwalk and the ocean. This only happens once in a blue moon and I always hope it will. June didn’t even know it was a possibility as it’s never happened in the three previous times she’s been on this ride. 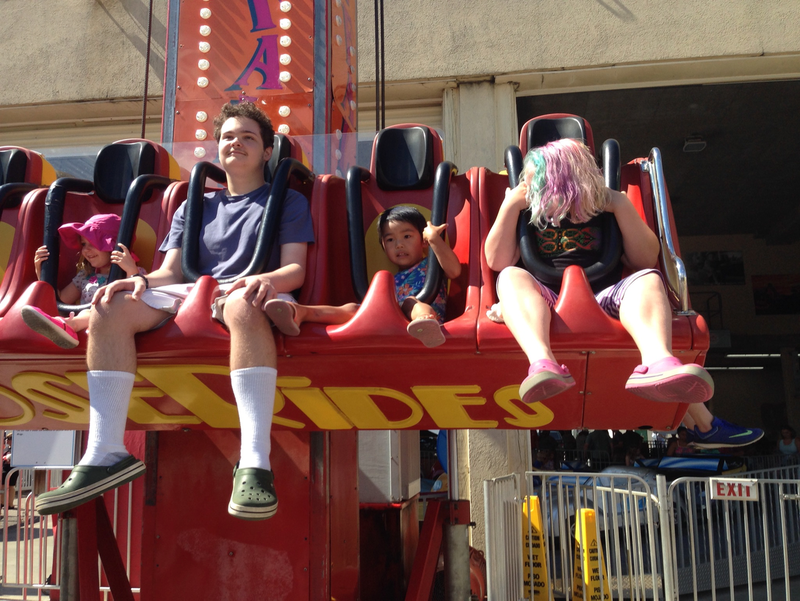 After the mansion, June went on the Graviton and the Free Fall, and we found Grandmom and Lan-Lan. June and Lan-Lan went on the teacups together, which Lan-Lan loved, though they scared Noah when he was in preschool. She was laughing the whole time. Based on her other favorites, I think fast but low to the ground is what she likes right now. Everything that spooked her went too high. Everyone else drove home, but I decided to walk because the night was so lovely. The sky was still pinkish orange from the sunset and the wet sand was silvery and reflective. Saturday was the usual rush of cleaning out the fridge and packing the cars and saying goodbye. We had to return the keys by ten, so we left before Mom, Sara, and Lan-Lan were out of the house and on their way to Philadelphia where they’d fly to Oregon the next day. We were planning to linger in Rehoboth a few hours. 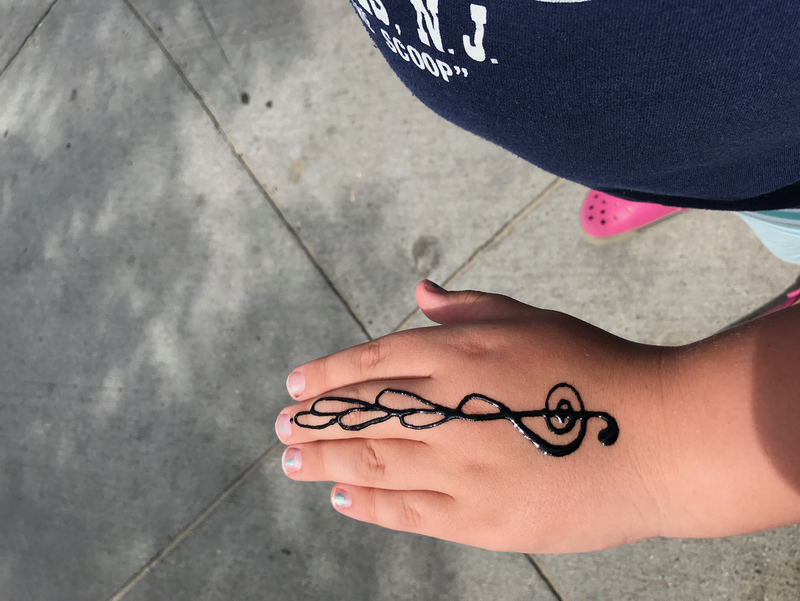 Beth, Andrea, and June went to town to get henna tattoos for June—a treble clef on her hand and a moon and stars just above her ankle. 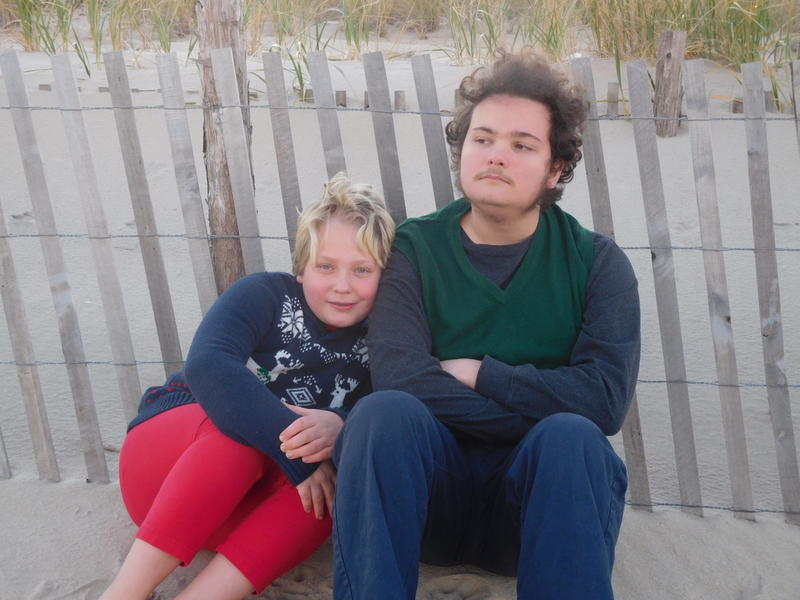 Noah and I went to the beach and I was pleased that he came in with me again for fifteen minutes or so. Then he went to relax on the towel while I swam for another fifteen minutes. I had only changed into my swim bottoms and a t-shirt at the house, thinking I might just wade, or we’d walk up to the boardwalk and change in the restrooms there, but I had developed some painful blisters on my toes and breaking up the walk was appealing and once I was in the water, so was diving under the waves, so I just did it in my clothes. Around eleven we started walking toward our meeting place on the boardwalk. We got lunch at a crepe stand, ran some errands, and drove out of town, around two-thirty. We stopped at home furnishing store where Mom had pointed out some birdcages she liked to June (Mom collects them) because June thought they would be a good birthday present for her, but it turned out they were store decorations and not for sale. Around quarter to five, we got to the Bay Bridge, where the sky got suddenly ominous. Then as we reached the middle of the bridge, it was just like driving into a high-domed cave. The clouds were that defined, and they had clearly visible projections like stalactites hanging from the bottom. Once we were completely under the cloud cover, it began to pour rain, which lasted for just a few minutes before petering out to light rain and pale gray skies. On one side was vacation; on the other was the rest of the summer with all its chaos and camps and performances, and music lessons, and driving school, and whatever else awaits us in the next nine weeks. I got the AARP card in the mail about a week before I turned fifty. Even though a few of my friends have already turned fifty and mentioned that this happens, I was still surprised. I don’t mind turning fifty, but it does take you aback. Ten years ago, I wrote about turning forty with flashbacks to my tenth, twentieth, and thirtieth birthdays thrown in for fun. To sum up the last two milestone birthdays: When I turned thirty I was mired in the endless, early stage of dissertation writing and not sure if I was going to make it through my Ph.D. program, and when I turned forty I’d recently come to the decision to quit looking for academic work, after a decade spent finishing the degree, then working at non-tenure track jobs or none, while chasing after the brass ring of a tenure track job. I described myself as “somewhat adrift” and uncertain what would come next. But I was an at-home mom to a one year old and six year old, so I was plenty busy and had some time to think about a plan. But instead of planning a new career, I just sort of fell into the work I do now. That summer I started doing a couple hours of research a week for my sister’s free-lance writing business because she had a big project and she needed some help. After another year or so I was ghost-writing the occasional article for a natural foods newsletter for her. When June started kindergarten, we made it a regular part-time job. Will I still be working with Sara when I turn sixty? Your guess is as good as mine. The weekend before my birthday Beth and I went to see Fun Home, a musical adapted from Allison Bechdel’s graphic novel memoir of the same name. I’d asked for tickets as a birthday present, because I am a fan of Bechdel’s work in general and this book in particular. Part of it even takes place at Oberlin as Bechdel attended Oberlin, graduating in 1981, seven years before Beth and eight years before me. And while the scenes depicting a young lesbian coming out at our small liberal arts college during roughly the same historical period I did were certainly familiar, the childhood scenes were, too. Like Bechdel, I also lived in a small town in Pennsylvania in a Victorian house my unhappily married parents were restoring. There were differences, too, of course. The two main ones being my father wasn’t a closeted gay man and he did not die by suicide. Also, we only lived in that town for four and half years, not my whole childhood, so we weren’t rooted there. But I still consider that period from the end of third grade to the middle of eighth grade to be the heart of my childhood and it had outsize importance to me. Anyway, the play was well written and well acted and we enjoyed it. The evening before my birthday I spent pleasantly sequestered in my room, reading with Noah or looking at my phone, under orders not to come out while everyone was wrapping presents and signing cards and the smell of a chocolate cake baking wafted into the room. The day itself was a normal work day. In the morning, I cleaned the bathroom and then I ghost wrote a blog post about pregnant women’s intake of omega-3 fatty acids. I did take myself out for a late lunch at Republic, where I had a Brie, arugula, apricot, and pistachio sandwich. From there I walked to Capital City Cheesecake where I ran into the children’s librarian from our public library. She greeted me my name, even though it’s been quite a while since June and I were regulars at her Circle Time for babies, toddlers, and preschoolers. I told her it was my fiftieth birthday and she said, “That’s a big one,” in the exact same tone she uses when someone is turning three and she’s about to lead the room in a round of “Happy Birthday.” (And if that sounds like it was patronizing, it wasn’t at all. She’s not one to talk down to kids.) I got a latte and free mini chocolate mousse there because it was my birthday. (I would not have known free treats were on offer if Karen hadn’t told me while we were in line). Then I headed back home to exercise and wait for Beth and the kids to come home. Beth and June came home around the same time (which early for Beth and late for June) because Beth cut out after a meeting and June had been walking a practice 5K with her running club. (She’s not confident enough on her recently healed feet to run yet.) It was a cold, wet day and she was soaked through, so I hustled her off to a warm bath while Beth went out to pick up dinner, which was Mexican take out at my request. I opened my presents after dinner. Noah got me two graphic novels by Margaret Atwood I didn’t even know existed, so that was a nice surprise. And June got me a gift certificate to Starbucks, a purple tie-dyed beach towel, and a home-made gift certificate for the Tea and Spice Exchange in Rehoboth because my big present, from Beth, was a weekend in Rehoboth. I knew there was a surprise planned for this weekend because Beth told me not to schedule anything and we had to cancel some plans as well. 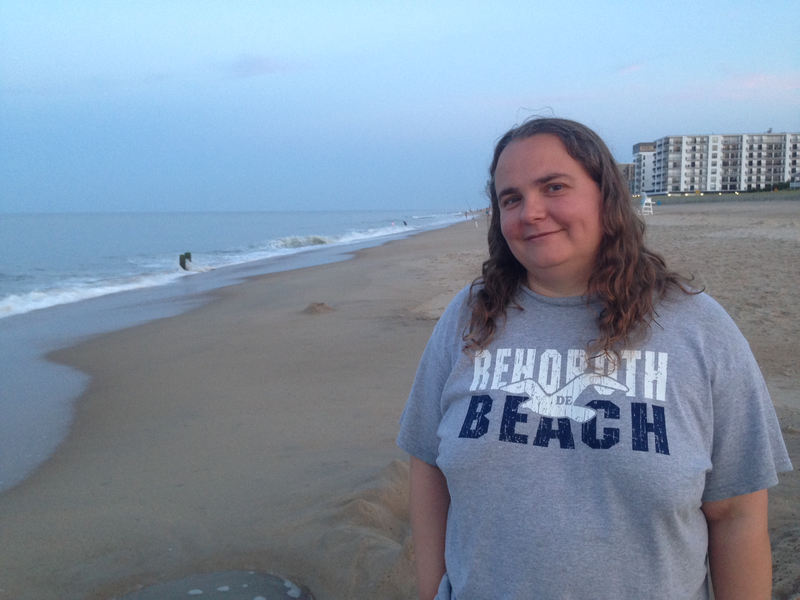 I was thinking a trip to Rehoboth was likely but I didn’t know for sure until I was working at the computer on the morning of my birthday and a notification about our hotel reservations flashed across the screen. I resolved not to tell anyone I knew and even rehearsed what I’d say when I opened the card to make it sound as if I was just learning the news. “Hooray! That’s what I hoped it would be,” I said, which was true. I didn’t fool Beth for a second. “You knew,” she said, so I told her about the notification. I’d eaten a late lunch and a big dinner so I wanted to wait on the cake. I read Deadweather and Sunrise to June and then we had cake and ice cream. 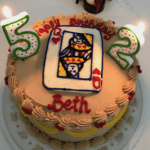 It was a chocolate cake with strawberry frosting, which is the cake I most often request for my birthday—you would, too, if you ever tried Beth’s chocolate cake with strawberry frosting—and Neapolitan ice cream. The next day was our beach trip. We hit the road around 4:45 in the afternoon. 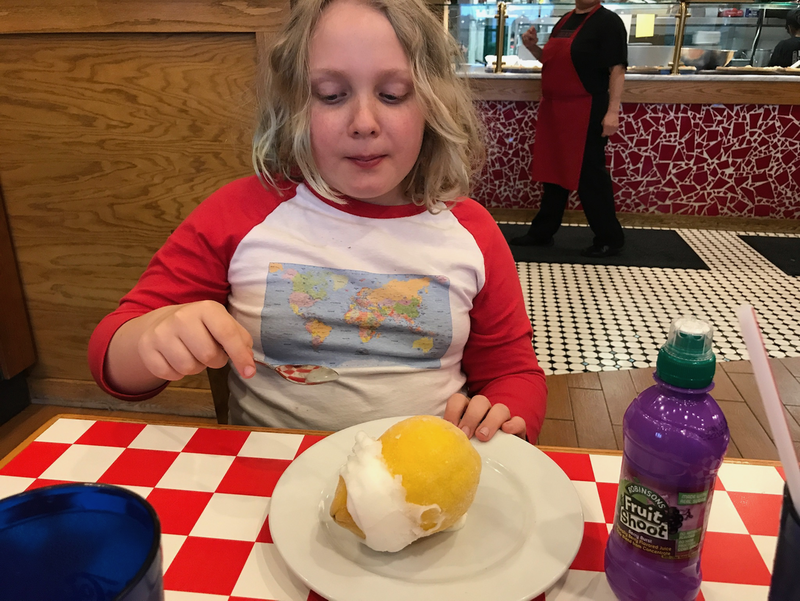 It was raining on and off, sometimes pretty hard, so between the rain and rush hour traffic and a stop for dinner (at a pizza place near the Chesapeake Bay Bridge where June got a sorbet served in a frozen, hollowed out lemon for dessert) it was around 9:15 by the time we checked into our hotel. June and I slipped down to the beach for a quick visit and we all went to bed around ten. In the early afternoon, I took a walk on the beach. It had stopped raining but it was still chilly and overcast. As I walked, I was feeling pensive about turning fifty. I saw several teenage girls who seemed to be playing volleyball without a net. They were all in identical black capri leggings, which made me think they were in uniform under their various hoodies and windbreakers. Then I saw an older man in a tweed jacket and a ball cap who was probably doing tai chi. I thought life is like that. Sometimes you’re just reacting to other people’s moves, knowing what general direction you want to move the ball, but unsure if you’re getting over the goal or not because you can’t see it. And sometimes it’s being on your own, making what may look like crazy moves even as they have an underlying purpose and grace. Beth and June had gone to Funland, so I headed over there to meet them. I got nostalgic walking past the little kid rides, but then I remembered I’ll have a chance to see my niece ride them this summer, which was a cheering thought. June had almost used up her ride tickets and was moving on to the games. We left with two new stuffed animals (a llama she named Lorenzo and a tiny sea turtle she named Flo) to add to the little Japanese cat (Sakura) she bought earlier in the day at Candy Kitchen. We swung by the tea and spice shop where I got three kinds of tea, vanilla sugar, and a new infuser. Then we got some free Earl Gray crème tea they were giving away for Mother’s Day. I’m not sure if they were giving it to all women or just those with kids in tow. Back at the hotel where Noah was doing pre-calc, I took June back to the pool. We read for a little while, but it was too loud to keep going, so we gave up. She got in the water, I stayed poolside and we tossed a ball back and forth. Then Beth came down and I went up to the room to read with Noah. By dinnertime, we were three-fourths of the way through the 120-page reading he had to do in The Sympathizer, a novel about espionage within the Vietnamese-American community shortly after the Vietnam war. It’s good, but intense, so I would have preferred it in smaller doses. We had dinner at Grotto. 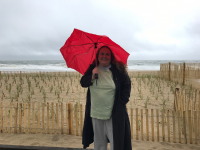 I was supposed to pick all the restaurants because it was my birthday weekend, but there would have been an uprising if we hadn’t gone to Grotto and to tell the truth, a trip to Rehoboth would have felt strange without it. While June was in the bath, I made a quick visit to the beach. It wasn’t raining but it was still cold and windy. The waves were big and full of foam, which the boardwalk lights gave a yellowish cast, like the whites in old photographs. The foam gathered on the sand, only to be half blown away before the next wave could wipe the remnants off the wet sand. Sunday morning was sunny and sparkly, so June and I took a pre-breakfast walk down on the beach. We saw volleyball nets all lined up om the beach, as if for a tournament and someone setting up mile markers for a race on the boardwalk. We’d wondered if everywhere would be mobbed for Mother’s Day, but we got to Egg by eight and there was only a twenty-minute wait, so we took a walk by the canal. I recommend the peanut butter French toast, (though if you’re there in the fall or winter, the pumpkin pecan French toast is even better). Noah’s lemon curd crepes looked pretty good, too. We returned to the hotel where Noah and I sat on the balcony and knocked off another chapter of The Sympathizer, while occasionally looking up to enjoy the ocean view. Beth and June made their third visit to the pool. After we checked out of the hotel, Noah went to work in the lounge of another hotel, Beth and June went to a coffee shop and I walked down the boardwalk, where I saw a man playing the pan pipes and a group of mostly middle aged and older folks—a church group perhaps—gathered by one of the gazebos singing “Kumbaya.” I heard someone say they saw dolphins but I couldn’t spy any. Though my birthday weekend is over, I am not quite finished with celebration. 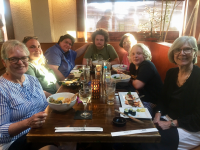 I’m having dinner out with several friends, but not for a few weeks because June’s Girl Scout is going camping next weekend and over Memorial Day weekend, we’re going to New York City to see Charlie and the Chocolate Factory on Broadway, which was one of June’s birthday presents. Fifty is getting off to a busy start. It was a quiet drive to the beach. It usually is now that the kids disappear into their electronics on long drives. Beth and I didn’t have much to say and I was trying to keep my mind off current events. I made sure to admire the trees along the highway, past peak, but still pretty. But my thoughts inevitably wandered from nature and as we were exiting the Chesapeake Bay Bridge I realized I’d barely looked at the water and this is the loveliest part of the drive to Rehoboth. We arrived at the house and ate a late lunch of sandwiches we’d picked up at the WaWa just outside town. June and I left around 2:30 to take a walk on the beach. It was a warm, sunny day. 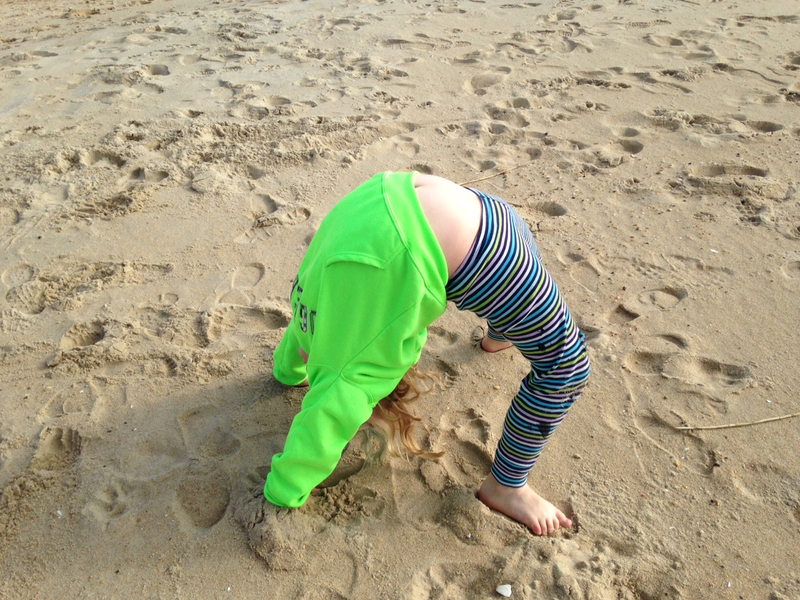 We’d brought hoodies in case it was windy on the beach, but we didn’t need them. 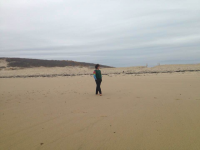 June took her shoe and sock off her good foot and walked half-barefoot on the sand. She’s using crutches on and off since she stopped wearing the boot and I wasn’t sure how she’d do with them on the sand, but she got along decently. We rambled back and forth between the beach and the boardwalk. I was happy to be moving, enjoying the mellow late November sun and the salt tang of the air. We ran into the family of a sixth-grade girl who was in the string ensemble at school with June last year. Her dad was on crutches, too, and we exchanged stories about why. By the time we left the beach at 3:45, the clouds were just touched with pink. Back at the house the kids and I made our traditional apple-turkey table decorations, with a twist this year. June gave hers three heads and Noah’s had none. Then Beth and I finished cooking the dinner we’d started at home the previous day. We feasted on a tofu roast, stuffed, mashed potatoes, sweet potatoes, mushroom gravy, Brussels sprouts, cranberry sauce, and rolls. 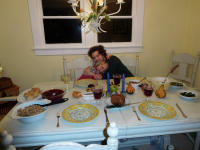 We didn’t share what we’re thankful for as sometimes do at Thanksgiving dinner, but I thought about it as we ate. There’s plenty. We have each other, decent health, enough for our needs and many of our wants, like a house at the beach for Thanksgiving weekend. We did the dishes and Beth made a fire. We sat in front of it and ate pumpkin pie, pecan pie, and apple tart. (I think everyone sampled two of the three desserts.) Once June was in bed and Noah was soaking in the big, clawfoot tub and Beth had retreated to our bedroom to read, I called my mom, and we talked while I watched the fire die. We got off to a slow start on Friday. Noah slept in—I woke him at 9:15 and he either went right back to sleep or just stayed in bed. He didn’t make it down to breakfast until 10:15. Around 10:50, the rest of us left him doing pre-calculus at the dining room table and went to take a walk on the beach and boardwalk and then to start our Christmas shopping. Beth split off by herself a couple times. Mostly I was helping June do her shopping. Between Candy Kitchen, the tea and spice shop, the seashell shop, and the bookstore, she nearly finished it. She wanted fries so we got some and sat on a bench on the boardwalk to eat them. 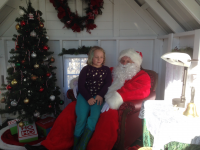 We were right next to Santa’s house and we noticed there seemed to be a lull in the line so we got into it. The people in front of us were forcing an unwilling toddler to sit on Santa’s lap. He was crying and covering his eyes with his hands. They took pictures anyway. What is wrong with people? When it was June’s turn, I noticed Santa had a safety pin and I wondered if it was political, but it was on his pants, so maybe he just had a rip there. The fries were just an appetizer. Next June and I had lunch at the Greene Turtle, which I patronize mainly for the view, so June thought it was logical to ask for a balcony seat. It was in the mid-fifties, not frigid but colder than I might think to eat a restaurant meal outside. I asked anyway. The manager was a little reluctant, but he seated us out there and we had the whole balcony to ourselves. The server said it was nice to step out of the overheated restaurant, but I tipped her 25% for having to go out of her way. June wanted frozen custard next but I was a little chilled from eating on the balcony so it was easy to say no. We went back to the house where Noah was still doing homework. He didn’t want to go out shopping with me, so I read to June and we relaxed until it was time to leave for an early dinner at Grotto’s. We wanted to finish in time for the holiday sing-along and tree-lighting downtown. Our regular Grotto’s had a line so we went around the corner to the smaller one on the boardwalk. The kids were slightly disgruntled because it wasn’t decorated for Christmas like the big one and there’s no gelato there. So after we ate, we went back to the bigger location where Beth and Noah got take-out gelato and June and I assessed the Christmas trees decorated by Delaware charities and she chose to bestow the dollar I gave her on a local cancer charity’s tree. The sing-along was much more crowded than two years ago, a year when it was bitterly cold and the only other time we’ve gone. Between not being able to get very close to the bandstand and the sound system only working intermittently we often couldn’t even make out what song the chorus was singing but eventually it got better and we could sing along. Noah hadn’t been that enthusiastic about attending this event so Beth and I were surprised and pleased when he started singing. I guess I haven’t heard his singing voice in a while because I was also surprised at how deep it is now. The songs were mostly secular (“Rudolph the Red-Nosed Reindeer,” “Let it Snow,” etc.) until the very last one, “Angels We Have Heard on High” and then they lit the tree. June and I got frozen custard to eat on the way home. (I was going to abstain but they had pumpkin-cinnamon, so what could I do?) Given the crowds, I was glad we’d walked instead of driving. I’m sure it was a massive traffic jam getting out of there. June was pretty tuckered out from walking most of the day on her crutches but she managed to stay awake long enough to watch The Year Without a Santa Claus before she went to bed. After she was in bed I took a bubble bath in the big tub and read half an Alice Munro short story, which was the only reading I did on the whole trip. We had breakfast out, at Egg. We’re looking for a new go-to place for crepes, now that Gallery Espresso went out of business, after a brief stint out in Lewes under the name Paradigm. 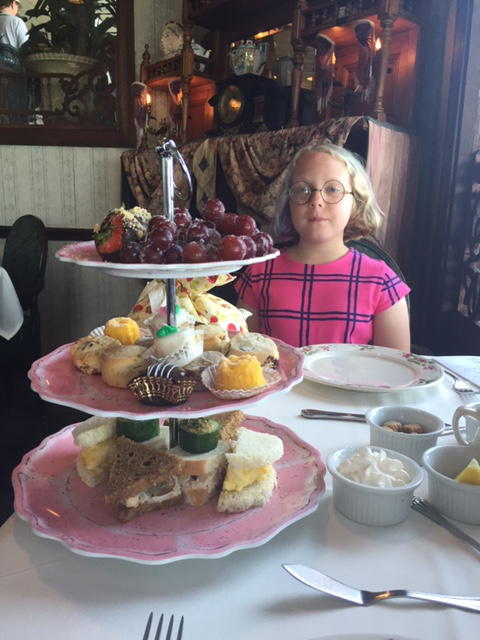 We all liked it, though June had been hoping to eat at the Boardwalk Plaza Hotel’s fancy Victorian-themed restaurant. As Noah was already out of the house, he and I did some of his Christmas shopping, while Beth and June did the same. Later Noah returned to the house to work, and I met up with Beth and June, who’d been to see the Boardwalk Plaza Hotel’s Christmas decorations. The next thing on June’s agenda was for me to read to her in the lounge of the Sands Hotel. This is something we used to do when we stayed there or when we stayed in nearby hotels without lounges and we needed to give someone (usually Noah) some peace and quiet. As we had a whole house to spread out in, it never occurred to me we’d need to camp out at the Sands. But apparently, it’s a tradition now, so I brought Eleven Birthdays and read it to her in front of their Christmas tree. I wanted to head back to the house for lunch and June wanted to eat lunch out so we compromised. Her first choice was Green Man, and mine was Grandpa Mac. I thought we were closer to Grandpa Mac, but I wasn’t sure, so I told her we’d eat at whichever one was closer. She agreed to the deal and I looked the addresses up on my phone. Sure enough, Grandpa Mac was closer, so I got to have baked mac and cheese with spinach for lunch and it was really good. While waited for our food and ate, we went over the test prep packet for the humanities magnet and I showed her how to make a graphic organizer and a web for the essay, as these are required and she’s never learned how to do that at school. That made me feel useful and pleasantly pedagogical. It was mid-afternoon by the time June and I got home. 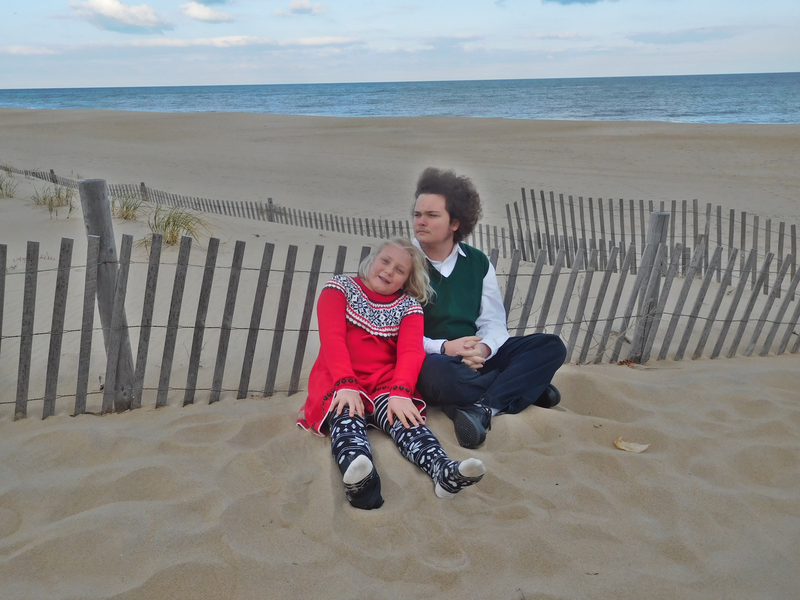 I had the kids change into their Christmas outfits so we could do a Christmas card photo shoot on the beach. We got some nice pictures, which increases the chances that we’re actually doing a card. Noah looks solemn in all the shots because I’d said I might want to do a pensive-looking card, but June disregarded that suggestion and smiled. I stayed on the beach after Beth and the kids left and walked south. I usually go north but there’s a beach replenishment project going on in the center of the beach that involves a lot of heavy machinery on the sand and a barge and a floating barrier out in the ocean. We walked by it many times over the course of the weekend and it was kind of fascinating to watch, but I wanted a quieter walk. The clouds were just starting to go pink. It was the time of day when the shadows in all the footprints and depressions in the sand get very sharp and the water is slate gray in places and silvery and illuminated with the last light of the day in others. 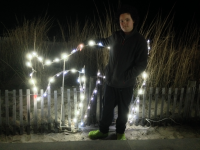 Shortly after I got back to the house we all left to see the light festival at Cape Henlopen State Park. It was a nice display, similar to the one we see in Oglebay most years, but smaller. They were also having a winter carnival in the Cape May-Lewes ferry parking lot, with live music and rides. We considered going up in the Ferris wheel but it was colder than the night before—in the mid-forties– and windy. I might have done it if I’d known for sure there would have been a view of the water, but we passed on it. There were also people ice-skating, or trying to, on a small rectangle of plastic. Back at the house Beth made another fire and we ate a dinner of food from various restaurants and Thanksgiving leftovers in the living room while we watched Christmas is Here Again. It was a cozy end to the day. 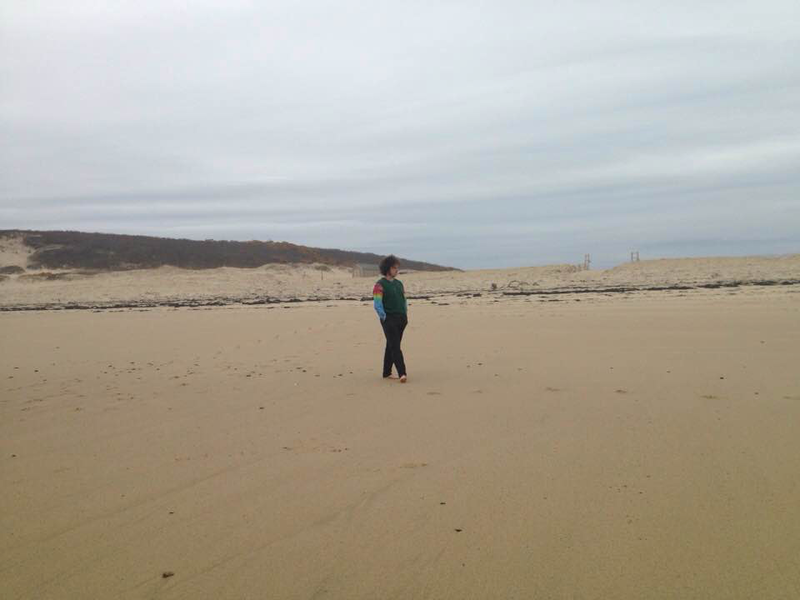 Beth made pumpkin pancakes, we packed up the house, and I took another short, solo walk on the beach. We drove to downtown Rehoboth where we did some more Christmas shopping and then June finally got to eat at her choice of restaurant, after having been overruled twice. She chose Green Man. I told everyone that the Green Man was a symbol of resistance during insurrections that followed the Norman Invasion, a fact I picked up from this book, which I read for my book club in September. Over our lunch of sandwiches and smoothies I explained to everyone how the Green Man was a symbol of authentic pagan Englishness in opposition to French Catholicism and how some of the native laborers who built the Norman cathedrals, included Green Men in the decorations as a small act of rebellion. The kids and I headed down to the beach one last time. Noah always puts his feet in the ocean for the number of waves that corresponds with the last two digits of the year whenever we leave the beach. He does it barefoot, no matter what the season. I do it, too, but with rain boots in the colder months. However, I’d left my boots in the car which was parked quite a distance away so I did it barefoot, too, but only for two waves. It was cold but not as cold as I thought it would be. June was sitting the ritual out because I didn’t want her to get her ankle brace wet, so I said I was doing the two, June the zero and Noah the sixteen in 2016. 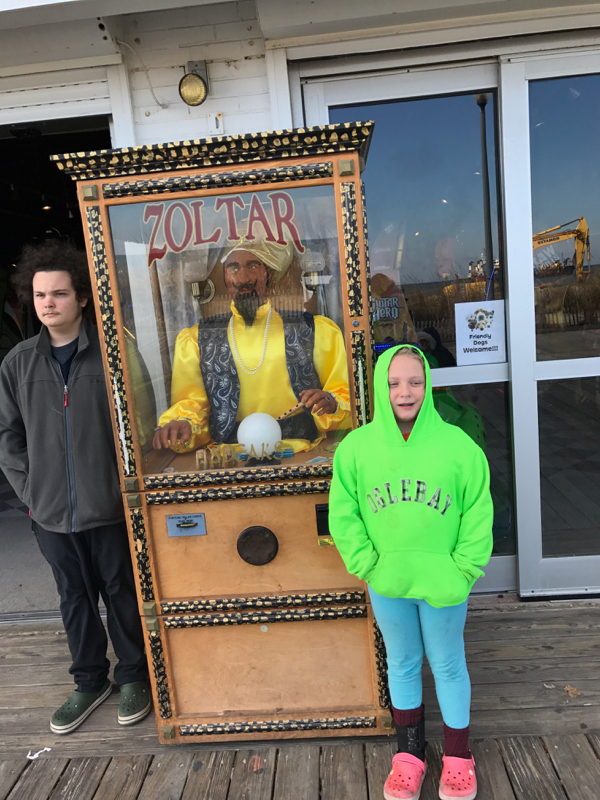 June wanted to get her fortune told by the mechanical fortune teller on the boardwalk. I said no reflexively but then she suggested the fortune might contain a phrase I could use as a blog post title. I handed over the dollar. 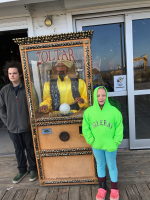 But, alas, Zoltar wasn’t working that day, so we didn’t get to see the future. It was around three when we finally hit the road after a long stop at the outlets to buy the kids new fleece-lined crocs and shoes for their upcoming band and orchestra concerts and some clothes for June. This timing meant we got to the Chesapeake Bay at 4:45. The sky was burning, the water was shining and as we crossed it, I felt just slightly replenished, more ready to face the uncertain future and to keep making small acts of rebellion. The logistics of getting everyone to the Delaware shore were complicated. 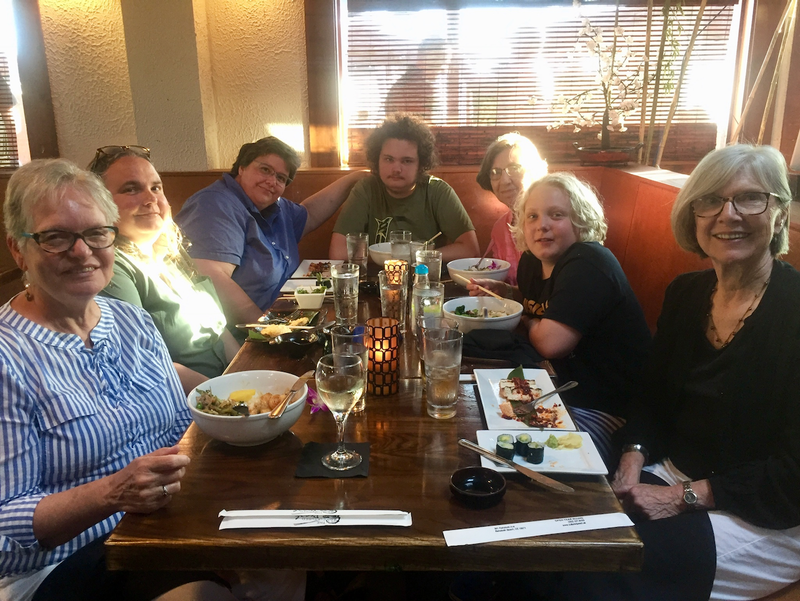 Members of our party were coming from Oregon (Mom), Idaho (my aunt Peggy and her ten-year-old grandson Josiah), West Virginia (Beth’s mom and Noah who had just spent a week with her), and Maryland (Beth, June, and me). To make matters more complex, Noah is taking a (mostly) online computer science class this summer and its introductory meeting was Saturday morning in Gaithersburg and the rental period started on Friday, so we’d be arriving in shifts. The West Coast contingent flew out on Thursday and stayed the night in Arlington, Virginia. Peggy and Josiah arrived first and had time to tour Arlington National Cemetery. Beth drove June and me on Friday morning to meet up with Mom, Peggy, and Josiah so they could drive us to the beach, while she stayed behind with her mom and Noah. They’d follow us to the beach the next day. Sure enough, we found Mom and Peggy outside their room. It took a while and many key cards to sort it out but eventually we got inside so they could collect their belongings and check out. We had to go to the car rental place next because they wanted to change the terms of the car rental. Finally, we hit the road, with Beth leading us through the challenging D.C. traffic. Once she got us safely on the other side she turned around and returned to the airport area, so she could meet her mom and Noah’s plane from Pittsburgh. When we were on Route 50 and driving at highway speed, Peggy noticed something moving on the hood of the car. It was her sunglasses, an expensive prescription pair. They were partially sunk into the cavity in front of the windshield wipers so they hadn’t fallen off the car the whole hour we’d been navigating stop-and-go city traffic. It was nerve-wracking watching the case jiggle as Peggy searched for an exit, but luckily, they stayed put until she was able to stop the car. Once stopped, she noticed an Afro-Caribbean restaurant. We’d planned to have lunch near the Chesapeake Bay Bridge, but we’d gotten off to a slow start, so it was already lunchtime and she was intrigued. I was wary—would there be anything vegetarian? Anything June would eat? The answers were no, but they were flexible about accommodating us, and yes. June and I got beans and rice and vegetables, with curry sauce (me) and without (June). It was tasty and inexpensive. The only downside was that the service was rather leisurely, but we were ordering off menu, so I suppose I shouldn’t complain. Between the printed directions Beth provided and help from Siri, we managed to reach Rehoboth. My mother, my aunt, and I are all what you’d call directionally challenged, so it was an accomplishment. 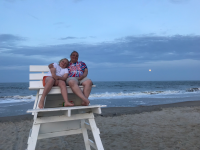 And even though I’ve been going to Rehoboth for twenty-five years, sometimes as often as two or three times a year, I don’t have the route completely memorized. I was able to provide useful input of the “this doesn’t look right” variety a few times and that’s when we’d turn on Siri. We got to the house around 5:30, unpacked, and went out for pizza at Grotto. We shared the upstairs with a baseball team, which seemed to be having an end-of-season banquet. It was so noisy they gave us 10 percent off our bill. When we left June and Josiah got three balloons between them (Josiah lost his first one almost immediately) and all three had popped or escaped within minutes of leaving. I was thinking we’d get frozen custard but it was cloudy and windy and so cool no one but June wanted any. Peggy opted for hot coffee instead. 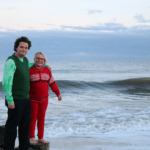 Mom went back to the house, saying she could be cold at the beach in Oregon, but Peggy, the kids and I ventured out onto the beach where June waded in the surf and Josiah dove right in, clothes and all. After fifteen minutes we went back to the house and put the kids to bed. Mom and Peggy went out to get a few groceries for breakfast and ended up doing a more substantial shopping than they planned. It was 11:30 by the time they returned and I’d long ago gone to bed. On Saturday morning June and I got coffee and juice at Café a-Go-Go and then we went to Browseabout, where I picked up an order I’d made online—Stephen King’s latest for me and two summer reading list books for Noah. I paid for them using gift certificates my sister got for our birthdays. June didn’t want to be left out so I got her a book, too. Next we visited a candy store and I got some licorice for my friend Allison. The store wouldn’t ship to Canada, so I took it to the post office, but I discovered there I’d left her address back at the house so I took June home, went to rent a bike, and rode it back to the post office. Did you know you have to fill out a customs form in triplicate to send a bag of licorice to Canada? Now you do. I got myself some lunch while I was out and then I came home and socialized with my relatives while they ate their lunches. Next, we all headed out to Funland. Josiah was impatient to go back to the beach and not too keen on the idea of going anywhere else, but once we got there he was as happy as June to ride the Freefall, the Sea Dragon, the Paratrooper, and all June’s favorite rides. 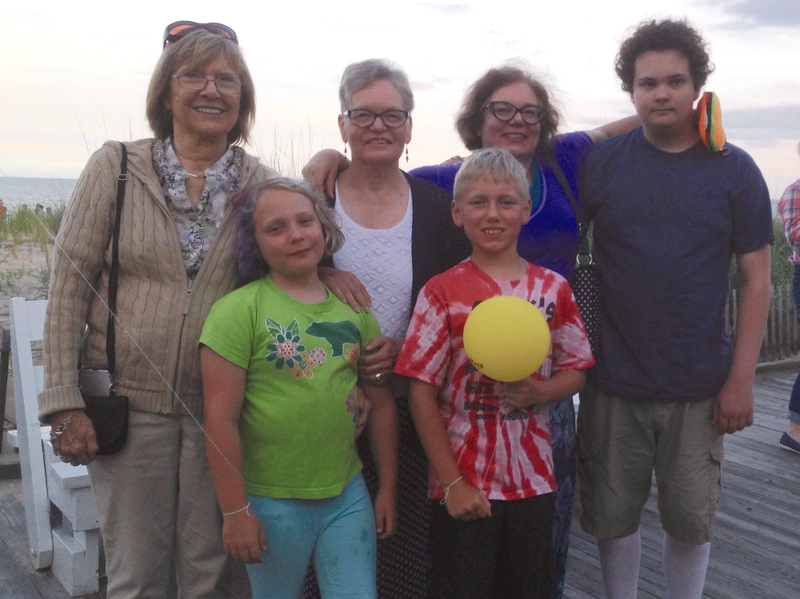 It was four-thirty by the time the kids and I got to the beach, and Mom and Peggy didn’t get there until almost five. Josiah wanted to swim out deep so I took him out through the crash zone, through the big waves, out to where the waves were just little swells. 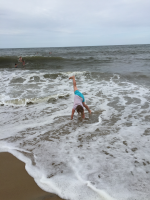 My kids have always been cautions ocean swimmers—June only learned to dive under waves last summer and Noah rarely wants to go out deep—so it was quite different, in a fun way, to swim with a kid who seems to have no fear. June watched and said if she had face mask to cover her eyes and nose she might be able to do it. When we returned to the house, around 5:30, Beth, YaYa, and Noah had arrived. I hadn’t seen Noah for eight days and he gave me a nice, long hug. Peggy made a tasty stir-fry for dinner and finally our whole party was gathered to eat it. Noah and June listened with fascinated expressions to a friendly debate Mom and Peggy had on the topic: “Is Linda sneaky?” Peggy argued pro and Mom argued con; but I think Peggy won the debate with examples of forbidden lipstick worn and movies attended when Mom was a teenager. (They had very strict, religious parents, and Peggy, who is nine years younger than Mom was apparently watching her older sister carefully.) Possibly the kids were wondering if they’d be arguing about their own childhood and adolescence when they’re in their sixties and seventies. On Sunday morning I took the younger kids to the beach to hunt for shells before the sun got too strong. It was a lovely day—with the exception of one cloudy day every day we were there was a lovely day—sunny, and with highs near eighty. We walked as far as the boardwalk where we got a face mask for June and goggles for Josiah. We looked for a boogie board leash for June’s board but we couldn’t find one. Once Josiah had his goggles, there was no keeping him out of the water, so I didn’t try and he got a second outfit in less than twenty-four hours soaking wet. I made a mental note to stop bringing him to the beach in clothes. We went back to the house and I read Harry Potter and the Order of the Phoenix to the Js. (He’s only read the first one but was game to jump into the fifth book. We stopped to explain things as necessary.) Next I read The Ask and the Answer to Noah, while the younger kids made things with melty beads—you know those multicolor beads you form into designs and then iron? The Js were playing with these all week. June made a smiley face, Santa Claus, an abstract design, and a princess while Josiah made a huge pile of people and skeletons, mostly heavily armed. The house was well stocked with toys and Josiah also built elaborate train tracks in their room that climbed up onto an unused bed and out into the hall until June told him she needed to be able to close the door. After lunch I took the Js to the beach. June was excited to try to go deep in the water but the waves were bigger than they’d been the day before and both kids decided to ride the waves on their boards close to shore instead, while I went further out. While they were riding, the foam core of June’s board snapped. The fabric enclosing it held it together but it gave a wobbly ride now, so she wanted a new one. Mom and Peggy had been looking for materials to make her board a leash but they didn’t find exactly what they needed and we ended up buying her a bigger board with a leash, like Josiah’s. June is not naturally fearless. She can seem like the daredevil in the family but it often takes a lot of effort for her to screw up her courage and try something hard. The remarkable thing about her is she so often makes that effort. In fact, when she agonizes, Beth and I are often telling her it’s okay to wait to do something, there’s always next year, etc. But you know how this story ends, right? She was visibly scared and I was scared for her and wondering if it was a good idea, but after a lot of wading in and running back while Josiah honestly didn’t seem to understand why she wasn’t going in already, we were past the point where we could avoid the waves and I started giving her curt, tense instructions, like “Dive! Dive now!” and she did it. When she came up from under the first really big wave, I said anxiously, “Are you okay” and she exploded into words. “It was awesome! It was so fun! I love this!” So, she was okay. I could touch bottom about three-quarters of the time but the kids couldn’t at all, so when she got tired or to needed to clear her mask, June clung to my side and once Josiah realized this was an option he occasionally clung to my other side. We dove under some waves and jumped into others. June loved it when a wave pulled her up its side and dropped her down its other side. “That’s my favorite, too,” I told her. Sometimes it’s as hard to get out of rough surf as it is to get in, but we were lucky in this respect. A wave carried us gently to shore not once but over and over and we kept going back in for two straight hours. Once toward the end June was tired and I was holding her in both arms and she was sort of slumped down and a lifeguard waded out to make sure we were okay. It’s reassuring to know they watch that closely. Meanwhile Peggy had arrived and was watching from the shore. We got out to say hi. I was pretty tired so I offered the kids ice cream, partly to get a rest. We went up the sandy path to the snack shack and ate our cones in the shade of the little building among the scrub pines. When I said I wasn’t going back in the water, Josiah decided to go back up to the house with Peggy while June and I went to sit with Mom. June sprawled out on her towel with her eyes shut. She was done in, but happy. June said in surprise, “You seem to know this song.” I should, I was a big fan of Cat Stevens and Harold and Maude in my youth. Mom left the shower in a different direction than I anticipated so we waited longer than we needed to but I didn’t care—it was such a perfect moment. And once we were clean and dry and inside, Mom’s delicious fettuccine with asparagus in lemon cream sauce was almost ready. Monday morning Beth took the Js out and bought a long-handled shovel for Josiah and a new board with a leash for June and rented a bike for Josiah. They were planning to ride bikes to a pond where there are a lot of turtles, but now that Josiah had a shovel he wanted to dig right then and June wanted to go see the turtles, but he was overruled. YaYa set off on foot before they left and Peggy drove to join them. Surprisingly, they all managed to find each other and the turtles. The Js also climbed a big tree and when June’s croc floated away in the pond, Josiah helpfully fished it out with a stick. I rode my own bike to the boardwalk where I sat in the shade of a gazebo within sight of the ocean and spent most of the morning chronicling our adventures thus far, by hand in a composition book. Later Peggy, Josiah, June, Noah and I went to the beach, in groups. When Noah and I arrived, June was riding her board and Josiah was digging. She said he’d been doing that for an hour and a half. 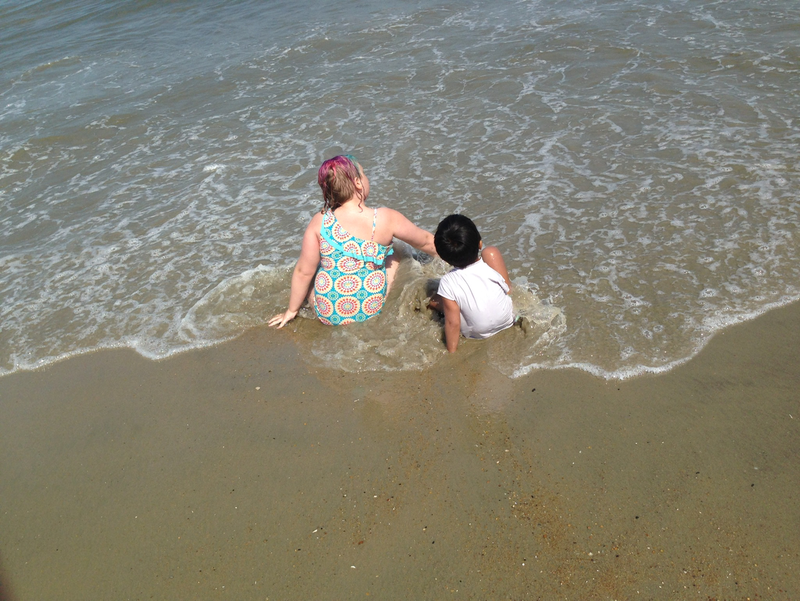 Noah got his legs wet and then retreated back up to the towel while June and I went into the water. There was a strong northward tug so we’d gotten close to the red flag that marks the swim area and we needed to exit more hurriedly than I would have liked, rather than waiting for a good wave, but June handled it well. Later she wiped out and got the wind knocked out of her. She started crying once she could breathe and we went to sit on the sand. I was wondering if this was a get-back-on-the-horse situation or time to call it a day so I just kept quiet and waited until she said, “Let’s go back in” and we did. 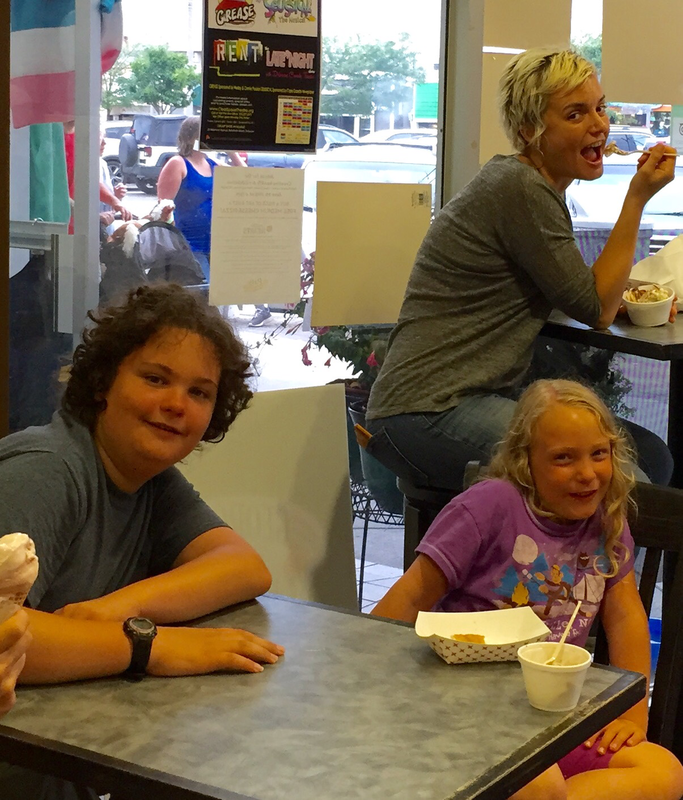 I was getting tired of trying to stay in the area between the flags so we took an ice cream break with Noah. I abstained because I knew Beth was back at the house making her signature beach house meal of gazpacho, salt-crusted potatoes with cilantro-garlic sauce, and Spanish cheeses and I wanted to be hungry for that. Peggy and Josiah had left by that point, but Mom had arrived just as we were getting back to the towels. June rode her board while Noah and I stood in the surf, talking about books and movies and his computer science class. It’s too easy for him, but it meets a tech credit he needs. It’s silly that the media classes he takes for his program don’t count, but they don’t, and no one can test out, so he’s studying Scratch, which he taught himself how to use when he was seven or eight. Noah left the beach around 4:20 and June wanted to go soon after because her suit was full of sand but she couldn’t find her crocs. (It was a bad day for those crocs.) We thought maybe Peggy accidentally swept them up with her things so June wore Mom’s sandals to the house and of course, when I returned I forgot to bring them with me and Mom refused to let me go back and get them so she had to walk back to the house barefoot. And it turned out June’s crocs were on the beach after all. Peggy gave me directions to where they’d originally been sitting and there they were. I stayed at the beach past six. It was nice to have some solo time there. Dinner was fabulous, as I knew it would be. Beth even put on some flamenco music for atmosphere. Peggy said she’d won the beach house cooking competition so far. Even Noah, who wasn’t sure if he like gazpacho, had seconds. We had some lemon curd in the house we’d been eating on short bread and pizelles and Mom and Peggy went out to see if they could find cake for it. Shortly before bedtime, June, who was sunburned, said it was bothering her. Her face was red and hot to the touch. Her arms and legs were red, too, and the back of her legs looked particularly angry. We had no aloe in the house, so Beth and YaYa left just as Mom and Peggy returned with a lemon cake. They came back with some Solarcaine and I applied it to all June’s red places. Then just as if she was in a commercial, she said, “It is instant relief!” After a few minutes it wore off so we re-applied and then she was comfortable enough to go to bed. I ate lemon cake with lemon curd on the porch with Beth and YaYa and then we went to bed, full of good food and satisfied. Tuesday we woke to the cozy sound of rain pattering on the roof. June came into our room around seven with the news that her burn felt better. We had breakfast and I was thinking of reading to the Js on the porch but Josiah was getting ready to make pancakes with Peggy and June was busy with a melty beads project. I considered doing laundry but Noah was still sleeping and he was wearing a pair of pajama bottoms he’d had on since Saturday night and my mom’s room was right off the laundry room and she was still asleep, so I decided to wait. I thought I might take a rainy walk on the beach but the rain stopped as I was getting ready so it was more of a cloudy walk. The sand was only a little damp so I was able to sit on it and read and write. Later I walked pretty far north up the beach where a group of condos sets out free beach chairs for people staying there. As none were in use, I didn’t think it would be much of a transgression to occupy one. The sea was calm, with moderate waves, widely spaced. It was a leaden color where it was flat, with just the tips of the tallest ways a translucent green-gray. I was on the beach four hours, since I didn’t need to avoid the sun, and I saw two big pods of dolphins, one traveling south and one north, plus plenty more travelling in smaller groups. 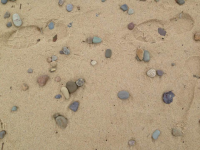 There were crabs on the sand, not the tiny gray, bullet-shaped ones that burrow in the wet sand, but classic crab-shaped, sand-colored ones, that dart out of holes in the dry sand and scuttle sideways to the next one. I also found two horseshoe crabs washed up on the beach. I thought they were dead, but when I nudged them with my toe they wiggled their legs, one weakly, the other vigorously. I took them back to the water and watched as the waves took them back into the sea. I came back and had a pleasant lunch of dinner leftovers with Beth. The house was mostly empty as Peggy, Mom, and Josiah had gone on a day trip to Dover to see a plantation and YaYa had taken June to lunch, and Noah was holed up in his room. When June came home she had a bag of gummy butterflies, a new dress, and reservations for high tea at the fanciest hotel in Rehoboth. By the time I’d read to both kids it was late afternoon, but June and I snuck in a quick swim before dinner. This was our designated eat-out night. The older generation was going out for seafood. Beth and I were taking all three kids to Grotto because Noah hadn’t been there yet and it’s his favorite. June had an attack of reflux during dinner and didn’t eat much. She was quiet and looked unhappy in the way she often does before a migraine so Beth and I kept pestering her with questions about how she felt and asking if she wanted to go home, but she said no, it was just her throat. We were headed for Funland, specifically the Haunted Mansion, which seemed like just about the worst place for a migraine. But we were getting frozen custard and there was the walk to Funland, and no doubt a long wait in line, so there was plenty of time to watch her. 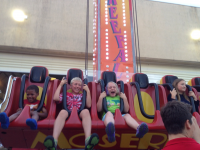 And she did start to perk up as we approached Funland, and was fine after that. “Moderately,” I said, after some thought. “Not at all,” Noah said, with teenage nonchalance. So Josiah had to draw his own conclusions. Afterward he said he wasn’t scared at all, but the souvenir photo of him and Noah told a different story. I didn’t buy any as we already have a souvenir photo of June looking scared at the Haunted Mansion from two years ago (bought at her own insistence) and I didn’t think Josiah wanted a photo of himself looking scared at the Haunted Mansion. June needed to use the bathroom afterward so I told Noah and Josiah to go meet Beth who was waiting on a bench on the boardwalk, but somehow they lost each other. “I thought he was following me,” Noah said and I was going to be annoyed with him until I remembered I lost Josiah on the very first night when I thought he was following me to the outside shower and he’d run off to chase a firefly. It so happened that Mom, Peggy, and YaYa were having a post-dinner stroll on the boardwalk at just that moment and they found Josiah. Eventually everyone was reunited. Having everyone in one place, I was tempted to go home, but the Js wanted to ride the Freefall, so we let them have one ride before going home. In the morning Beth took all three kids to Jungle Jim’s waterpark and I enjoyed more solo beach time. While I was in the water, I saw a perfect V of geese fly above me flying north and quite large pod of dolphins. Mom and I went out for lunch at our traditional beach lunch spot. Mom asked me if I was sad to be leaving in two days and I said, no, I was still in the moment and enjoying being at the beach. She looked surprised, not without reason. Often I am sad in advance to leave. Beth and the kids had returned from the water park when we arrived so Peggy took Josiah to the boardwalk and Mom took June on a series of adventures. They went to Funland where she won a stuffed cow at an arcade game, to Candy Kitchen where she got a big lollipop, and the seashell shop where she got a necklace with a seahorse encased in plastic. I read with Noah and then went back to the beach in the late afternoon. I was thirsty as I was walking down the sandy path to the beach and suddenly a cherry snow cone seemed appealing so I bought one at the snack shack. I walked down to the water’s edge to eat it. The sun was warming the back of my legs and the sea breeze was cooling my face. The shadow of a gull passed over the sand just over my shadow’s head and it was one of those moments you want to seal in your mind and remember forever. Later Beth and June came down to the beach, followed by Peggy and Josiah. There was time for June and me to have a brief swim and for Josiah to fly his new kite. YaYa made a scrumptious spinach lasagna, garlic bread, and salad for dinner, which everyone appreciated. June had such a busy day we hadn’t had a chance to read so we slipped out to the porch to read another chapter before bedtime. On Thursday morning we split into two groups. Peggy, Mom, and Josiah went to tour a light boat while YaYa, Beth, and our kids had a breakfast at a boardwalk crepe stand and then spent most of the morning wandering around town. June got a pair of yellow flowered flip-flops, required for the showers at Girl Scout camp, and mooned over the hermit crabs we’d staunchly refused to buy her all week. The day before, she’d told me, “Grandmom says if I keep asking, eventually you’ll get me a hermit crab”—a statement my mother flatly denies making, so I’m not sure exactly what went down between them. Both the snails we got for June’s birthday died within six weeks, along with the last surviving one she brought home from school last fall. We promised to replace the snails but I am over shelled creatures with short life spans. I also don’t like the idea of taking a sea creature away from the sea or the unnatural designs they paint on their shells. When I told June pestering wouldn’t work, she asked what would and I said growing up and buying her own in eight years. We hit Candy Kitchen, the tea and spice shop, the soap shop, and Browseabout books where June bought Harry Potter glasses with three weeks’ allowance and Noah got a book with the rest of his birthday money from Auntie Sara. Finally, we recovered from all this shopping with coffee, juice, and frozen hot chocolate at Café a-Go-Go. Back home, I read to June, then Beth took her on a bike ride and picnic at Gordon’s Pond and YaYa took her out to tea. I did laundry and hit the beach until it was time to come back and make dinner—veggie burgers with corn, a tomato and mozzarella salad and various leftovers because it was the last night. Mom, Peggy, and Josiah left the next morning around 8:45. They had timed tickets to Mount Vernon at 1:55. We finished packing and June and I returned my and Josiah’s bikes to the bike rental place. 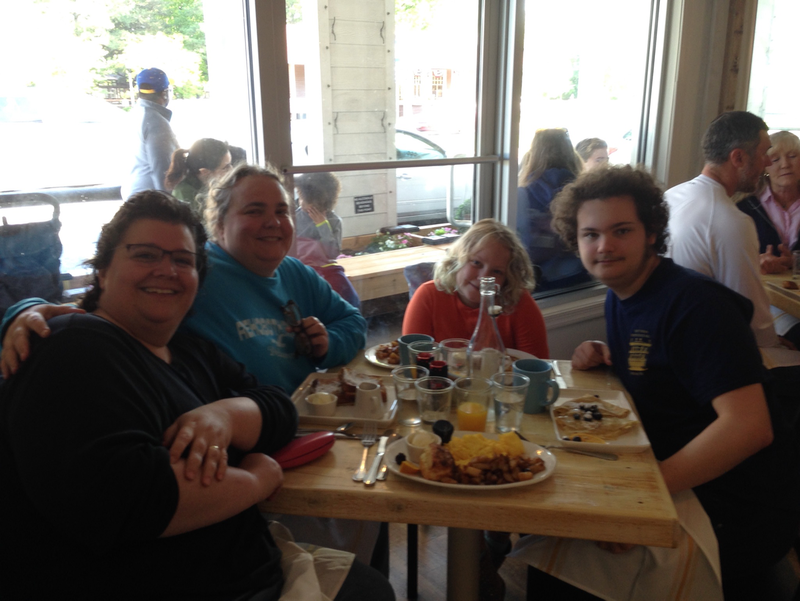 Then YaYa, Beth, and Noah spent the rest of the morning in a coffee shop while June and I swam for over an hour. By this point June wanted to get right into the waves, no easing in and getting used to the cool water. “Mommy, are you coming?” she kept saying as she strode deeper into the ocean. We met up with the rest of our party for lunch—boardwalk fries and crepes from a stand in a little alley off Rehoboth Avenue. Noah said “crepes in the alley” made it sound like they had cocaine in them, but mine was just Swiss cheese and walnuts. I cannot speak for the others. The kids and I went back to the beach to put our feet in the water one last time. Well, Noah and I put our feet in the water. It was more of a whole body experience for June, but she was still in her bathing suit, so it was okay. We strolled down to Funland to use up our tickets. June played arcade games and both kids rode the Paratrooper as I watched their bare feet soar high above me, right before we left the deep blue sea behind until our next visit. Beth worked from home Friday morning and took the afternoon off, so we could leave for our annual Christmas shopping trip to Rehoboth when the kids got home from school. After she drove Noah to school she swung by Starbucks and returned with a peppermint mocha, which she delivered to me at the bus stop where I was waiting with June. I knew then it was going to be a good day. It was, even though we got to the beach later than expected. There was traffic around Annapolis and a detour toward the end of the drive. But we made the best of it, singing along with our Christmas music and admiring people’s lights as well as what we could glimpse of the light display at Sandy Point State Park from the highway. By the time we got to our dinner destination of Grotto Pizza it was 7:40, which is quite late for us to eat, and everyone was so tired and hungry we all just sat around the table silently until the food came and then we perked up a bit. After dinner Beth drove the kids to the condo we’d rented. I walked there because it was just off the boardwalk and I wanted to see the ocean. It was a clear night, so as soon as I left the lighted portion of the boardwalk I could see a lot of stars, though the only ones I could identify were in Orion’s belt. I think if I lived at the beach, I’d learn all the constellations. I walked down onto the sand for several minutes and got close enough to the water so it almost touched my feet, yet somehow I managed not to get my Birkenstocks and socks soaked. I had the briefest flash of feeling the bigness and beauty of the world before I turned back to land. It was a concrete building, with approximately thirty units in two levels over a parking garage, with balconies connecting the units like a motel. It was completely deserted—we never saw another soul coming or going or another lit window the whole weekend. It was also a bit down at the heel; there were rust stains on some of the outside walls, and cobwebs in the lobby. Also, the pool had been left uncovered and was full of dirty rainwater. Inside our unit was clean and comfortable, however. Our biggest complaint was a lack of blankets—we had to turn up the heat higher than we otherwise would have—and a lack of WiFi. But the location couldn’t be beat and there was a partial ocean view from two rooms, so I was satisfied. We did call it “the creepy condo” the whole time we were there, though, because that sort of thing amuses us. 7:30 Saturday morning found me on the beach. The last golden-pink light of the sunrise was still lingering when I arrived. One of the nice things about being at the beach in December is I can see the sunrise over the ocean without getting up any earlier than I usually do. I watched the daylight get brighter and clearer. 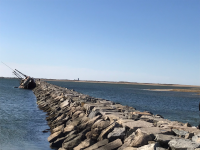 I walked north and noticed a big deposit of shells on the sand I thought June might like to see and I stood on wooden jetty (on one of the few pilings not covered with slick, wet moss) and watched the water rush in and out under my feet. After an hour, I returned to the house, hungry for the oatmeal Beth had made and left on the stove for me. 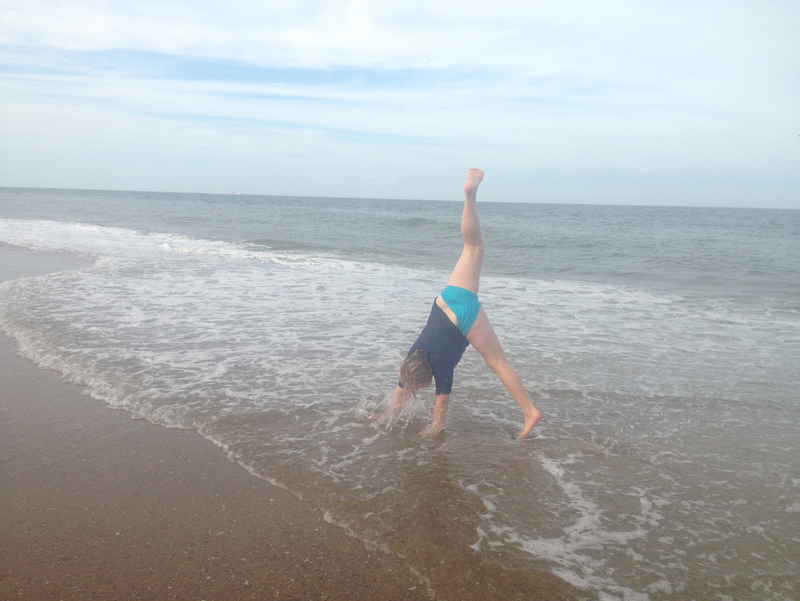 “How was the beach?” Beth said. “Invigorating. I am full of vigor. I have the vigor of ten Stephs plus one. Or is it two?” I struggled to remember the line from the Grinch. I think it’s the strength of ten Grinches, plus two. We’ll see when we watch it this year. After eating my oatmeal, I settled down on the couch to read June from a book about a zombie stuffed animal that wreaks havoc in an elementary school, suitable reading material for a creepy condo, I suppose. Sometime around ten, Beth, June and I left to start our Christmas shopping, while Noah stayed at the condo to work. He was collaborating on a group presentation about contemporary drama with the members of his group contributing to a document in real time. They do this kind of thing a lot, the young people. We started with a pit stop at Café a-Go-Go, where we’ve been getting coffee and pastries for ten years, and learned they were closing the next week, as the owners are moving to Texas. Maria was saying goodbyes and hugging customers and posing for pictures the whole time we were there. She and her husband Jesús will be missed. 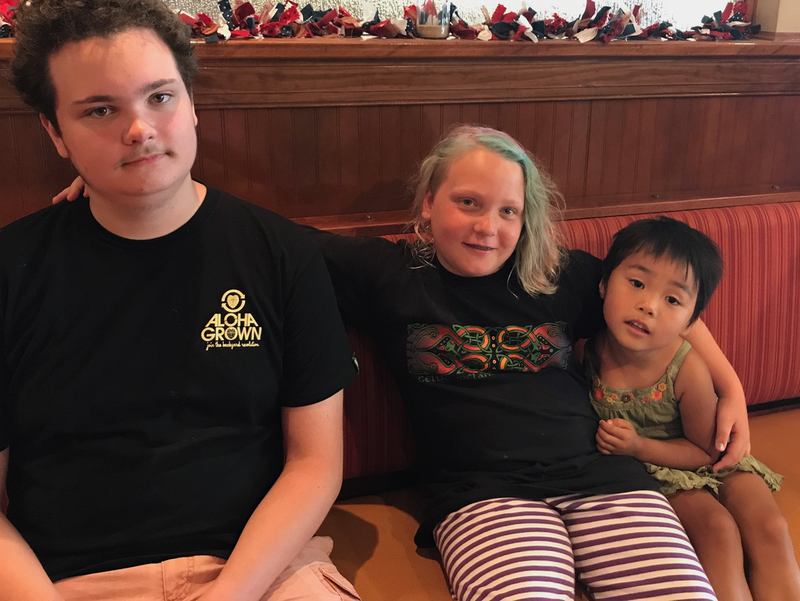 They’ve seen Noah grow up from a preschooler and June from an infant and they always remember us, even though we’re only in town two or three times a year. I was sad to hear the news, but Beth, who has spent many hours reading and drinking coffee there while I was at the beach, seemed stricken. We hit our favorite stores: the book store, the seashell shop, the tea and spice shop, and the candy store. As we were exiting Candy Kitchen, we noticed Santa was in his little house on the boardwalk and was open for business, even though he wasn’t supposed to be there until three. June, who had been debating whether to ask for a gift certificate to get her hair dyed again or new ice skates, decided she’d visit Santa right then and ask for the hair dye. Santa commented he’d never had that request before but he’d see what he could do. With that accomplished, it was time to think about lunch. We split up, with Beth and June going to a new build-your-own pasta bowl restaurant and me going to the Greene Turtle, which I patronize mainly for the ocean view, though I do like the apple-pecan salad. We invited Noah to join us, but he stayed at the condo and heated up leftover pizza. Beth had developed a bad headache so after lunch she took to her bed and stayed there until dinnertime. 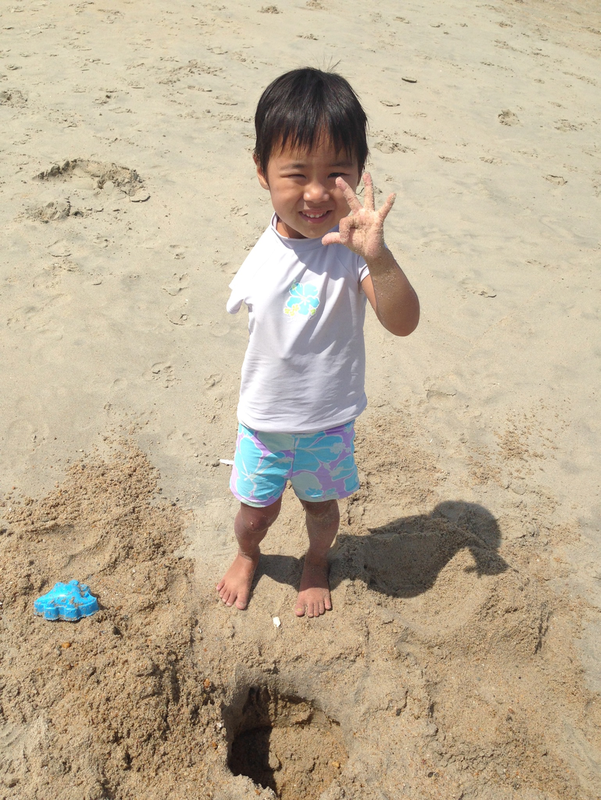 I took June to the beach to collect shells, which she needed for someone’s gift. Never mind whose, it could be yours. We went back to the condo where I was hoping to pick Noah up and take him Christmas shopping but he was still working on his drama presentation so I went alone. Before hitting the stores, though, I lingered on the boardwalk, watching the sky turn pinker and pinker. Late afternoon sunsets are another bonus of December beach weekends. By the time I returned, Beth was well enough to get out of bed so all four of us went to admire the boardwalk lights and the kids posed for pictures with them. Then we got takeout (Thai and more Grandpa Mac) to eat in front of A Charlie Brown Christmas. After June was in bed I quizzed Noah for a test on the Spanish-American War and WWI, using a very helpful collaborative study guide he and his classmates made. We were packed and out of the creepy condo by a little after nine. We drove out to Lewes to have crepes at our other favorite coffee shop in Rehoboth, which is no longer in Rehoboth, having inconveniently moved up the highway last year. But when we got there, after a twenty-minute drive, it was dark and the furniture was all gone so I guess it didn’t survive the move and its name change, from Gallery Espresso to Paradigm. I ask you, is that an improvement? I think not. In fact, we kept calling it Paradox and Parabola and Parasail and Noah’s favorite, Parasite. Silly name or not, I was sad to see it closed. I really liked the pumpkin crepes there and it’s another place they always recognized us. So we found somewhere else to eat, and then Beth took Noah Christmas shopping while June and I went to the Victorian-themed Boardwalk Plaza Hotel to look at their Christmas decorations. Next we took a walk on the beach, stopping at one of the rock-and-concrete jetties to observe the flock of seagulls that was perched there. 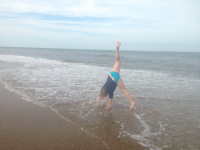 June was exuberant, singing Christmas songs and doing cartwheels and back bends on the sand. 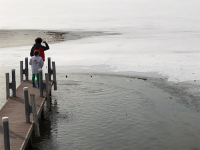 A passerby pointed out a white smudge on the ocean to the north of us and said it was a flock of thousands of snow geese. It wasn’t much to look at from that distance but maybe ten minutes later June noticed they had taken to the sky and we could see the air full of the migrating white birds. It was a beautiful sight. 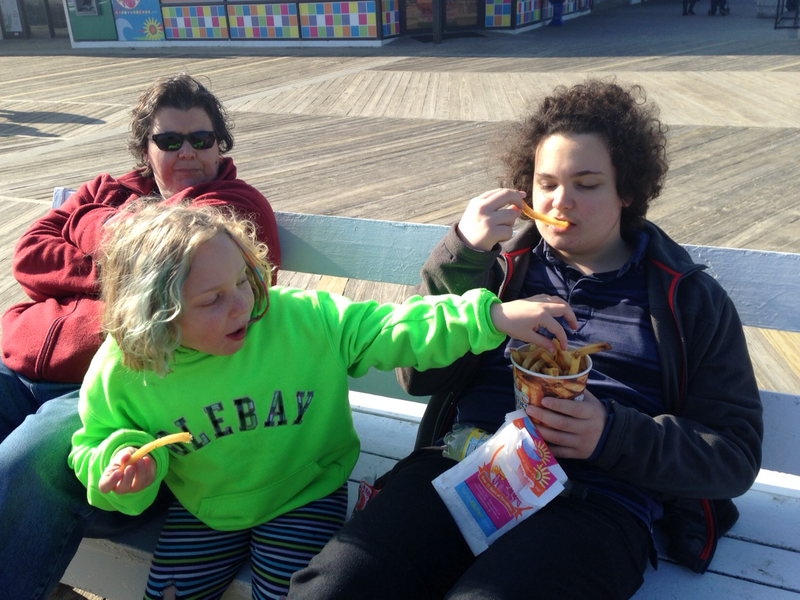 We met up with Beth and Noah for Thrasher’s fries on the boardwalk and then we switched kids and I took Noah shopping. He was pretty efficient and between Beth’s trip with him and mine he got almost all his shopping finished by early afternoon. 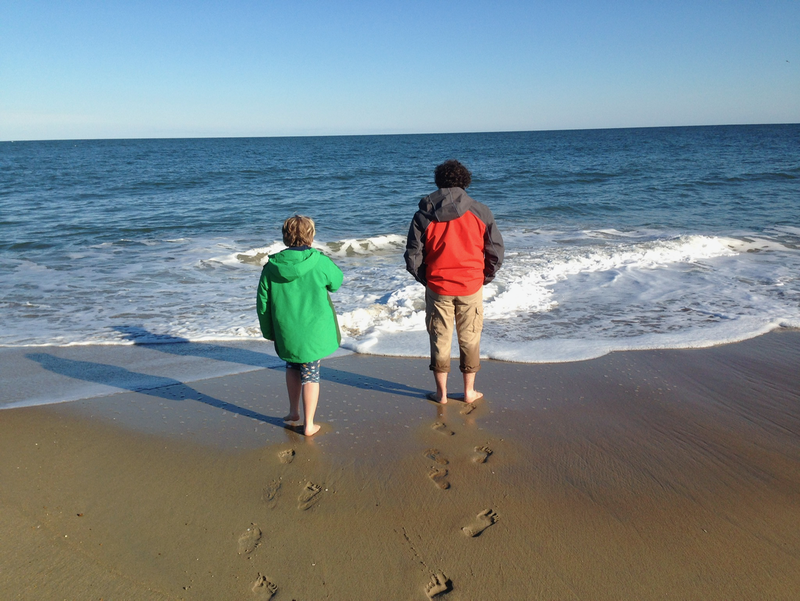 The kids and I went to say goodbye to the ocean, by putting our feet in for fifteen waves (it’s a tradition). June and I were wearing rain boots but Noah was barefoot. He didn’t start screaming from the cold until the eighth wave. I was downcast on the drive home, even as I scolded myself for feeling that way. It had been a good trip. I got in some beach time and did a good bit of my shopping and helped both the kids nearly finish theirs. But for whatever reason, the weekend felt too short, like I wasn’t finished with it. Maybe I was wishing Beth hadn’t been feeling ill most of Saturday or that Noah hadn’t spent his second weekend in a row on the road, mostly doing homework in a hotel room or rented condo. Or maybe I just wanted to see another December sunset stain the sand in apricot tones before going back to my regular routine. The week before we went to the beach, Noah was in West Virginia visiting with Beth’s mom. June’s last day of school was on Monday and it was a half-day. I parlayed that into a full day of work by sending her home with a friend and then the next morning I sent her to another friend’s house and in that day and half I did most of my work for the week. June and I had a fun day Wednesday—we took a friend of hers to see Annie at the theater than plays second run movies for a dollar a couple mornings a week during the summer. Afterward the girls played in the Silver Spring fountain until Evie’s mom picked her up and June and I had lunch at Austin Grille. At home we read in the twin hammocks in our back yard, I mowed the lawn, and made chocolate chip cookies for homemade chipwiches. I worked a little on Thursday and Friday. June had a friend over—it was her fifth play date in four days—and we packed for the beach. Late Friday afternoon Beth’s mom and Noah arrived in Silver Spring, where YaYa would stay in a hotel overnight before we drove to Rehoboth. We all had a pizza dinner at zPizza and then we left June to stay the night with her and we took Noah home. They swam in the hotel pool that evening and visited a flea market in the morning while we finished packing. At the market, YaYa bought June a teddy bear made of multicolored yarn there she named Tie-Dye, or Ty for short. We met up with them at the hotel and hit the road around eleven. We made great time, arriving at the realty around three, even with a long stop for lunch. When we got inside the house, Noah exclaimed, “This is a cool house. This is an awesome house!” It was certainly the biggest house we’ve ever had—it had six bedrooms so no one but Beth and me had to share and it featured a mix of wood-paneled and airier rooms, a retro-looking kitchen painted aqua, plus a screened porch that wrapped part way around the side of the house. And it was only a half block from the beach. Mom and Sara arrived around 4:30—Mom had another teddy bear for June, this one from her recent trip to Europe—and our party was complete. While Beth went on a grocery run and the kids got to work on the script of a movie they were planning to film, Mom, Sara, and I took a short walk down to the beach and then we came home and collaborated on a quick dinner—scrambled eggs with asparagus they bought at a farm stand on the drive, vegetarian bacon, and toast with orange-pineapple-apricot-peach jam from the same stand. I woke around six to the sound of rain on the windowpanes. I stayed in bed dozing until around seven and then I got up and had breakfast with June on the screened porch. 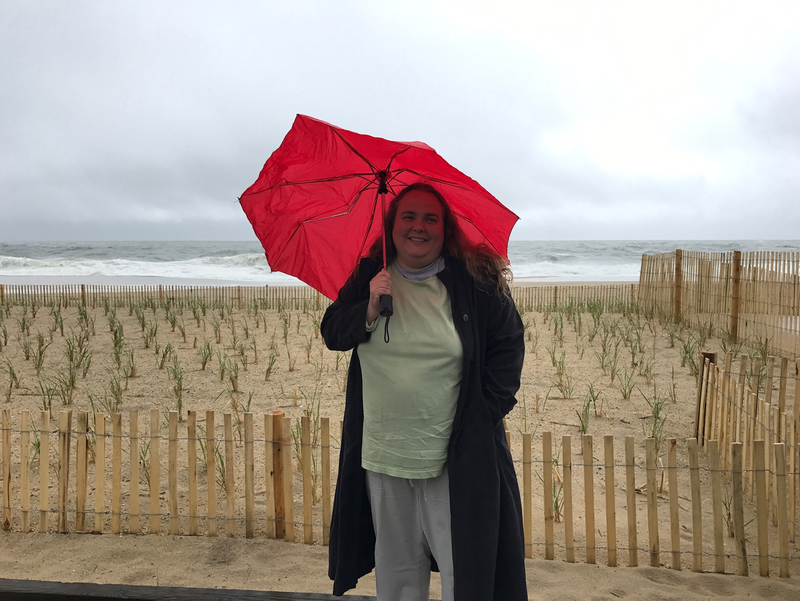 I was getting ready for a rainy walk on the beach when the sun came out so I left the raincoat I was borrowing from Beth at home and put on sunblock instead. The kids were working on their movie again and the rest of the adults were all either still getting up or eating breakfast. I spread a towel on the sand. The sky had cleared considerably—it was bright blue with big puffy white clouds scuttling across it. The sea was silver and sparkly and full of leaping dolphins, some quite close to shore. I stayed about an hour and a half, leaving around eleven to avoid most of the mid-day sun. At the house I read to the kids for a long time—over an hour each. June and I finished The Letter, The Witch and The Ring and started The Hobbit. Noah and I finished Crystal Keepers, which we’ve been reading slowly—sometimes just a few chapters a week—since his birthday in early May. 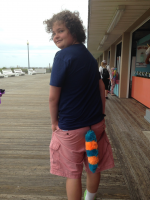 While I was reading to Noah, Mom took June to Candy Kitchen and to Funland, where over the course of the week June won countless stuffed animals and both kids won tails you can clip to your pants. About 3:30, I headed back to the beach, leaving Sara and Beth to work at the house. Sara’s whole vacation was a busman’s holiday, but Beth didn’t work much after Sunday. I was glad of that, as she often works through vacation. The day was now sunny and hot. I got a cherry snow cone at the snack bar on the trail down to the beach. We’ve never stayed on this stretch of beach before, but I’d explored this trail from the beach side during an off-season beach trip and I’d wondered if the little hut sold food in the summer, so I was happy to see it did. I’d tried to bribe Noah into coming to the beach with me by offering frozen treats but he preferred to stay in his room with the blinds shut. YaYa, who had just spent a week with him, had taken to calling him the Prince of Darkness, because of similar behavior at her house. I thought the idea of a secret little store, not visible from either the beach or the road, would appeal to June but she was so focused on her goals of getting someone to take her to 1) Funland, 2) Candy Kitchen, and 3) Jungle Jim’s water park that my description barely registered with her. Nonetheless, it reminded me of one of the years we stayed in The Pines and we discovered a grassy path that ran between the backyards of houses down the length of two blocks. We’ve been coming to Rehoboth for twenty-five summers now but I still love finding its hidden places. While June was off accomplishing goals #1 and 2, I got a voicemail from my mom, asking if June could go on the Sea Dragon, one of those swinging Viking ship rides. She loves those but she’d never been tall enough until this year. I said yes but advised my mother to skip it. The snow cone was bigger than I expected and I ate it in small bites to avoid brain freeze, so it was after four by the time I got in the water. It was early in the season so the water was cold—68 degrees, a 22-degree drop from the air temperature, so it was hard to get in, but once I was acclimated it was perfect—everything was perfect, the warmth of the air, the cool water, the pellucid light, the gulls wheeling overhead. The angle of the sun turned the sea spray from wave after wave into rainbows. I must have seen dozens of them. The waves were promising, big and breaking just where I like them. Then I jumped into the perfect one—it swept me up and into its inward curve and I flew over the top and dropped down to the water behind it, which is my very favorite thing to do with a wave. When it’s just right I swear I hang in the air for a moment before I drop, like Wiley E. Coyote, but without any injury resulting from the fall. Sometimes a whole beach week goes by without a wave like that. That evening Beth and I took a walk to the beach and watched the sun set on the longest day of the year. Monday started early because the alarm on my phone went off at 5:45. Noah had set it to go off Mondays to Wednesdays two weeks earlier when Beth was on a business trip to Detroit and I was getting him off to school. Since I usually leave it in its charger in the study overnight apparently I hadn’t noticed it going off in the interim. Neither Beth nor I really got back to sleep and the kids slept in that day, so we were eating breakfast together at 7:15 before anyone else in the house was awake. Later in the morning we went on a series of errands together. We got coffee and visited Browse-About books where we picked up Into the Wild, part of Noah’s required summer reading (or so we thought—he’s actually supposed to read Into Thin Air—Beth exchanged the book later in the week). I looked for my book club’s next book—Cloudstreet and Sara wanted some books on toxins for work, but they didn’t have any of them. We also visited the olive oil store, or tried to; it was closed. Lastly, we rented a bike for me and one for Sara (Beth had brought her own bike) and we rode them home. I’d been telling Beth I wanted to get back into the habit of going on dates and while it wasn’t the most romantic outing, we were alone for a couple hours, so I think it qualified. Back at the house, we ate lunch and then I started dinner because it was my night to cook and I wanted to go back to the beach in the late afternoon. I enlisted Noah’s somewhat reluctant help to trim and chop green beans and June’s enthusiastic help to shuck corn. I made it down to the beach by 3:30 and around 4:30 Mom, Sara, and the kids joined me. The ocean was very calm so I thought it was a good opportunity to get the kids to venture deeper into the water than they usually go. June agreed to try it when I offered to hold her on my hip. The water made her buoyant enough for this to be a feasible plan. 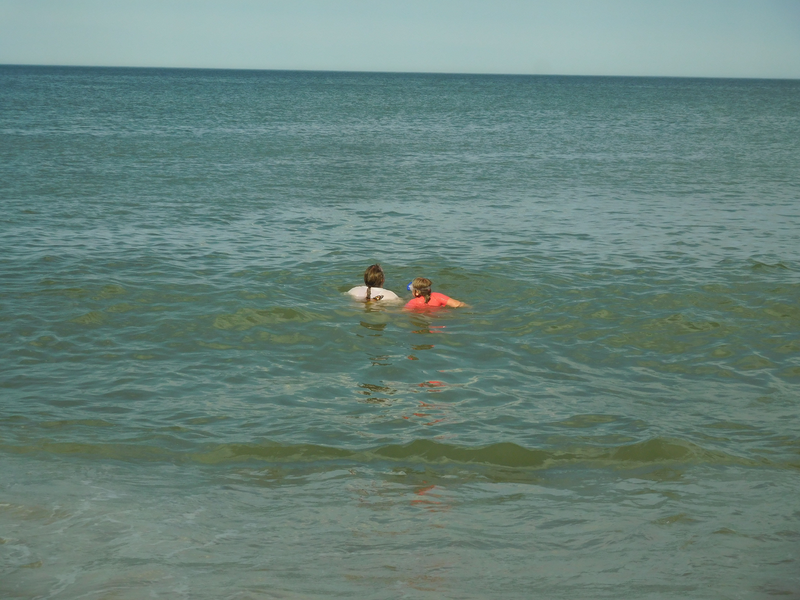 Sara and I passed her back and forth a couple times and then she said, “Let me go” and she was swimming in ocean water over her head for the first time ever. She’d tread water for a while and then she’d hang onto me again and back and forth. When I got out of the water, she stayed in, not as deep, but deeper than she normally would. 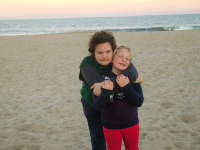 When it was time to leave the beach, she didn’t want to go and the promise of frozen custard on the boardwalk after dinner lessened but didn’t eliminate her disappointment. June was eager to go back to the beach the next day but she had to wait until mid-afternoon because she had a full day planned. In the morning she went on an early morning bike ride with Beth. I met them at Café a Go-Go for coffee, juice, and cake and then we all rode our bikes home. 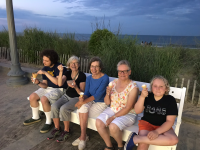 It was a hot day—it had reached 90 degrees by 9:20, according to the thermometer on Rehoboth Avenue and I was trying to be responsible about the sun, so I stayed in the house, reading to both kids, hanging out with Sara and Mom, and doing laundry. By 2:30, though, June and I were at the beach. We got snacks—potato chips for her and cherry water ice for me—at the snack hut. I settled on the towel to eat my water ice while June splashed in the shallow water. If I’d realized it would be the only rest I’d have for almost two and half hours, I might have savored it more. The waves were a little rougher than the day before, at least at first, so when I came into the water, June did more clinging to me than swimming. But the water calmed a little and she got a little more daring and soon she was swimming again. I suggested she try diving under the waves because it’s really something you need to do when you swim in deeper water, but she said no and I said okay. 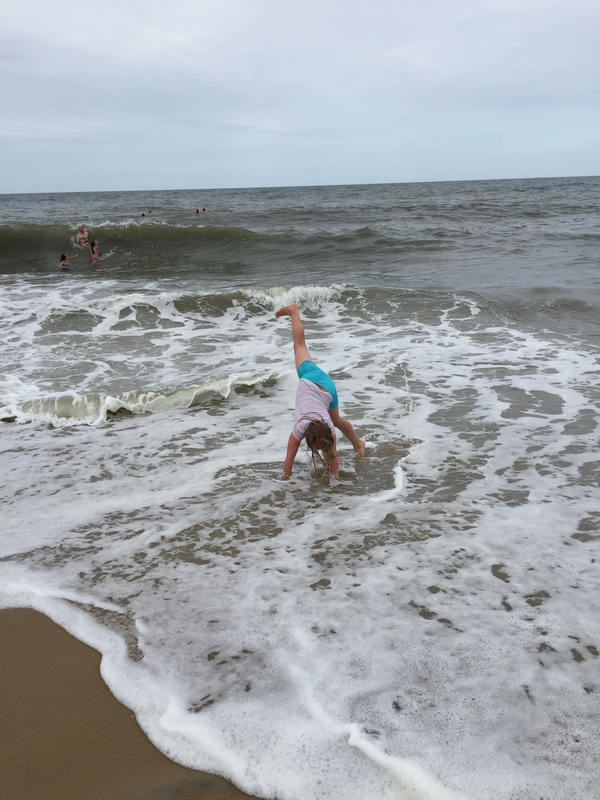 Then about an hour later, without warning, she dove under a wave. 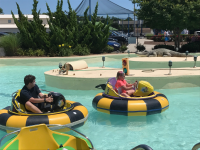 I applauded and she looked surprised at herself and said, “It’s that simple?” I said it was and that now she had more choices for each wave—dive under it, jump up into it, or ride it toward the shore. She did all three repeatedly. We were in the water until just before five without a break. I ended up mildly sunburned on my shoulders because we didn’t even get out long enough to re-apply our sunblock. She was so excited and pleased with herself that it was almost—but not quite—anticlimactic when I took the kids to the Haunted Mansion at Funland that evening and June kept her eyes open for the whole ride for the first time. When we came home, Sara was eager to show us two short videos she’d just received of her soon-to-be adopted two-year-old daughter playing on a playground in China. I can’t wait to see Lily-Mei splash in the ocean and rides the kiddie rides at Funland. 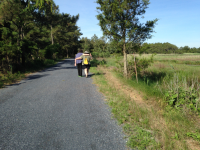 In the morning the whole crew—all seven of us—took at walk on the Gordon’s Pond trail in Cape Henlopen State Park. As you might guess from the name, the trail goes around a marshy pond and you can see all kinds of water birds. We saw gulls, snowy egrets, great egrets and red-winged blackbirds. There’s a wooden platform that gives you a good view of the pond and there was a nice breeze, too, so we stayed there a long time. The kids had considered filming part of their movie in the park (it’s the same park where they made a movie about a haunted watch tower during Noah’s twelfth birthday weekend) but artistic differences scuttled filming that day and in the heat of their arguing Noah almost didn’t come. But somehow the outing was salvaged and everyone seemed to have a good time once we got there. There had been a thunderstorm the night before so it was cooler than the day before, a beautiful morning really. The only sour note was when a man sped by us on his bike, yelling, “Get out of the way, ladies,” and knocked my mother’s walking sticks out of her hands. I guess there were no orphans or kittens for him to hit that day, so he had to settle for a senior citizen with bad hips. While Beth and the kids were gone, I had some solo time on the beach and then Sara joined me at the end. I went in the water a few times, but mostly I read because I hadn’t had much time for that. Mom and Sara made a lentil-sweet potato soup for dinner and afterward I read the Gollum chapter of The Hobbit to June while YaYa and Noah went out for frozen custard and to Candy Kitchen. After June went to bed and YaYa and Noah returned, I read Inkheart to Noah until bedtime. Beth and Sara made their own Candy Kitchen run while we read so after Noah went to bed, I sampled the chocolate-peanut butter and the chocolate-cheesecake fudge. In the morning Beth and Sara took a bike ride and when they came home Sara made almond flour pancakes, her specialty. Since we were all gathered together, we watched some movies the kids made—a mystery called Clara Green and the Missing Diamond and some of Noah’s school documentaries, the F-CON project on banking crises of the nineteenth and twenty-first centuries, and the one they shot in in New York City last fall about a Grammy and Tony-winning composer. After lunch the kids filmed a couple scenes for their movie after I helped them negotiate some of their differences and get back on track. In the late afternoon, June and I went to the beach and Mom and Sara joined us. June delighted in showing them her new ocean swimming prowess and they were suitably impressed. She couldn’t stop looking over her shoulder to make sure they were still watching. For dinner Beth made her signature beach week meal—gazpacho, salt-crusted potatoes with cilantro-garlic sauce, and Manchego cheese with bread. 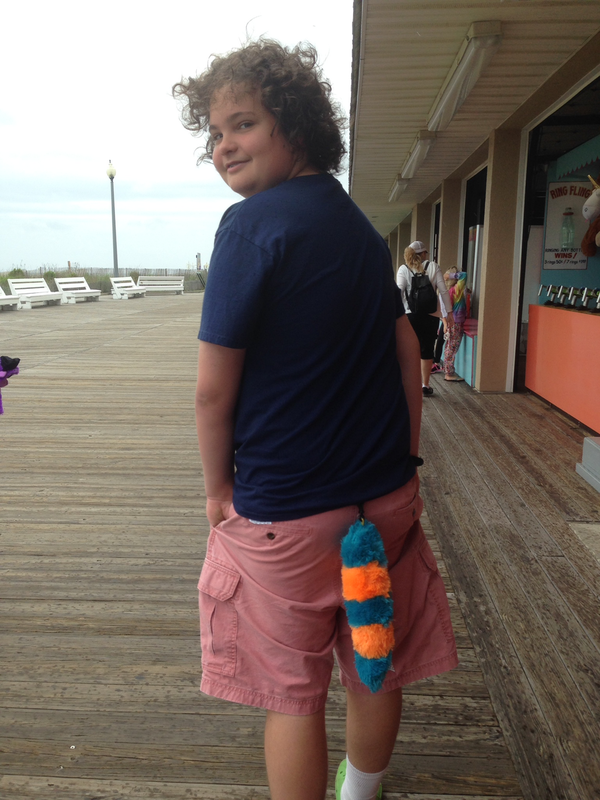 Then we all took a walk on the boardwalk and got ice cream. We stopped at the kite shop on the way home and June picked out a ladybug kite. Beth, YaYa, the kids and I went out for breakfast at Noah’s favorite place to get crepes, which has now moved from a prime spot on Rehoboth Ave to an office park in Lewes. This makes it less attractive to me, but I went anyway, to be a good sport and because the crepes are pretty good. Beth checked her phone while we were all getting buckled into the car to go back home and that’s when we discovered the Supreme Court had ruled and gay marriage was now legal in the whole country. I spent more time on Facebook that day than I probably should have on our last full day at the beach—I didn’t get to the beach until after three, but everyone was so joyful, I couldn’t help it. Beth posted a picture of the guesthouse where I proposed to her in 1991. 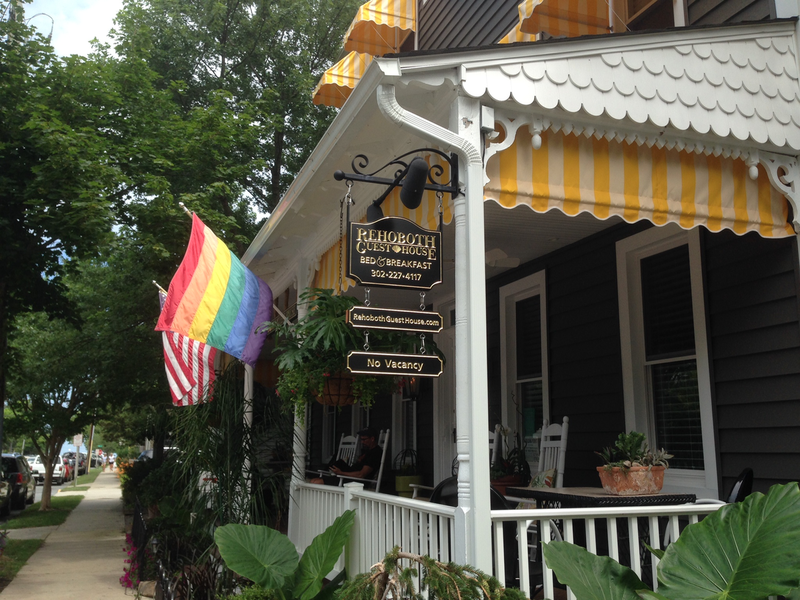 We’ve had a lot of important family moments in this town—from my proposal, to Noah’s first steps in a rental house just next door that guesthouse in 2002 to buying our wedding rings shortly after Maryland legalized gay marriage in 2012. 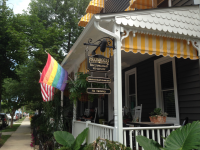 It seemed fitting we should be in Rehoboth when we learned that couples in the last holdout states across the South and Midwest could now start shopping for their own rings. In addition to reading Facebook, I also needed to act in Noah and June’s movie, which they ended up managing to film in two days, after having worked out the script earlier in the week. Everyone in the house had a part. YaYa and I were ghosts. We dressed in white clothes (I wore Beth’s bathrobe) and whitened our faces with zinc oxide. The play is about a woman, played by June, who receives a mysterious note from her ancestors and then travels across the sea to free their spirits, only to have them attack her before she wakes and finds it is all a dream. During the sailing song—filmed in a wood-paneled room that resembles a ship’s cabin—the sailor and her crew (Beth and Sara) sing an original song called “The Ocean Life’s For Me” and there’s a dance, too. After filming was finished, Beth, YaYa, June and I went to the beach. They flew the ladybug kite and then June wanted to show off her ocean swimming for them, but the water was much rougher than it had been earlier in the week and she couldn’t do it, so she settled for doing cartwheels in the shallow water. I’d had a fun, if challenging swim right before they arrived, with wave after perfect wave and more rainbows in the sea spray. Call it the pathetic fallacy if you will, but nature seemed to be celebrating, too. Beth, YaYa, the kids and I had pizza and gelato for dinner and then we made a final trip to Candy Kitchen. At home Noah finished editing the movie. He’d wanted to challenge himself to finish editing it while still at the beach and he succeeded. All the adults watched it before bed, as soon as Sara got back from a sunset bike ride in Cape Henlopen State Park. Everyone was impressed with June’s song writing and with the technical effects Noah used, especially how he made the ghost semi-transparent. In the morning, we packed up the house and said our goodbyes to Mom, Sara, and YaYa. 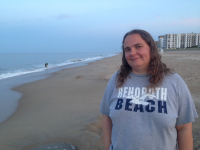 Beth, the kids and I stayed in Rehoboth for a few hours. It was cold, drizzly, and windy, so I sheltered in a boardwalk gazebo for a while. I didn’t want to go in the water too soon and get chilled in my wet suit. 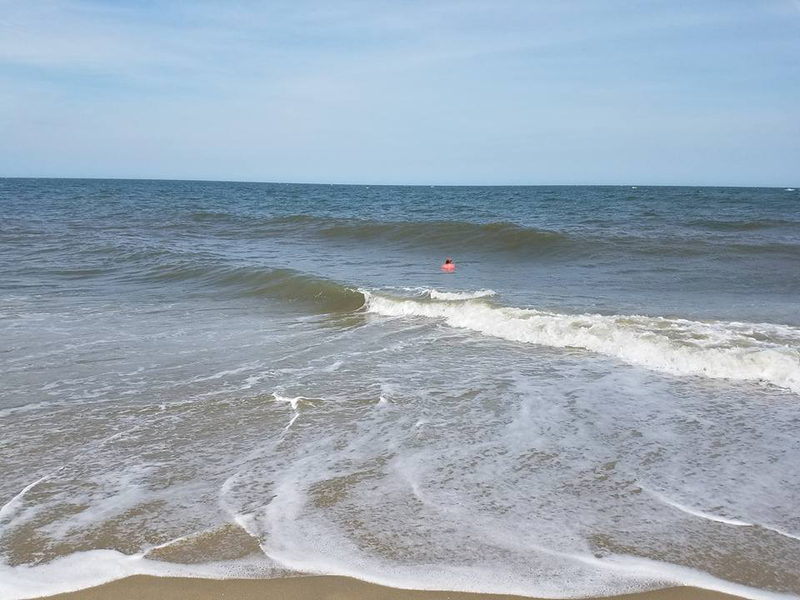 I finally got in the water around 11:15, after checking with a lifeguard to make sure it was allowed because the surf was high and no one else was swimming. I soon found out why. The waves were big—scary big—and really close together. I only lasted five minutes before giving up and getting out. I was getting pulled close to a jetty and I was afraid I might not be able to get out before without drifting too close to it, but I did. We had more crepes and orangeade for lunch at an outdoor stand in town—the rain had stopped but we would have eaten there even if it hadn’t because Noah insisted, pointing out there are umbrellas on the tables—and then went back to the boardwalk for fries and to say goodbye to the ocean. I was still cheerful from the marriage decision and not too melancholy about leaving. We’ll be back in November or December and our families will be back some time in the next couple years, and when they do, there will be a new cousin to share the ocean life with us.